A sample of quotes from some of our satisfied customers. 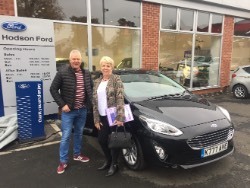 "This is the second time I have ordered a new Ford with Carwow and Hodsons, the process is simple, the prices are low and both Adrienne and Kerry are very friendly and communicative. 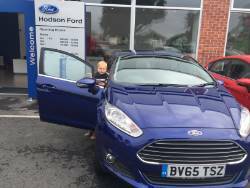 I would definitely recommend Hodsons and Carwow to anyone wanting to purchase a new Ford". 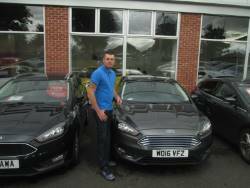 "Straight forward process and friendly. No pressure to place an order. 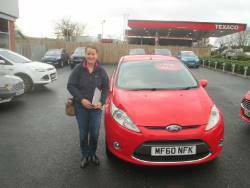 Kerry very helpful and has kept me updated weekly in relation to the order". 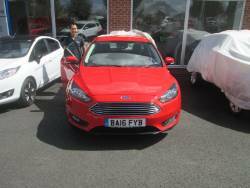 This has been the best car buying experience I've ever had so far - excellent from first query to order completion. 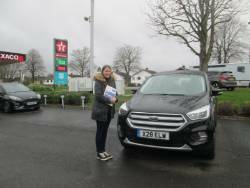 Kerry & Adrienne gave the best upfront prices by a considerable margin, and have been extremely responsive to questions, even on their days off. The ordering and finance procedures couldn't have been any simpler. Highly recommended. 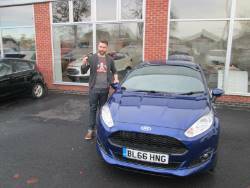 Dave commented "Fantastic service and such a handsome chap"
Kerry was fantastic, she made the car sale process go very smoothly and easy. I strongly recommend people to consider using this dealer. 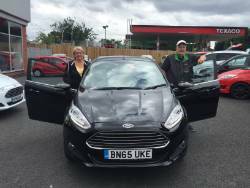 I woukd like to say a big thank you very much to Adrienne and Kerry for the fantastic experience with buying a vehicle from yourselves. It was very straightforward and organised! Just a shame about the weather when I arrived to collect the car. Easy to do business with and a great deal. 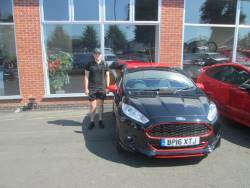 Very helpful and friendly managed to find the car we wanted in the colour of our choice at an extremely good price. 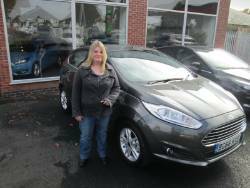 "Adrienne was very easy and friendly to deal with. 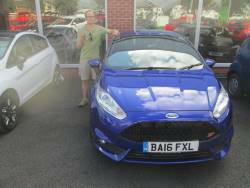 Gave me a good deal, will have to wait a few weeks for the car but that would be the same anywhere you order a spec'd up car. 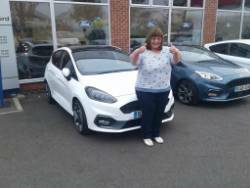 Thanks ,look forward to picking the car up"
"Straight forward and no stress "
Margaret collecting her new Fiesta ST from Adrienne and Kerry at Hodson Ford as you can see very Happy. 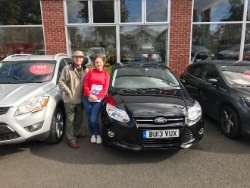 "Was a very easy deal to do , will only buy via carwow from now on Kerry and Adrienne made it effortless"
Mark Friendship kept me well informed on all aspects of the transaction. 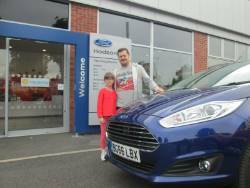 An excellent representative of Hodsons and the Ford Brand. 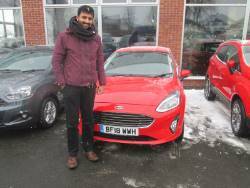 Mark Friendship was very helpful and made whole experience simple and easy. Mark is fantastic he helped me so much and always stayed in contact with me. 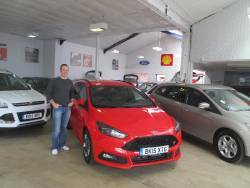 Have always used another ford garage but my business has now moved to Hodson Ford 10/10. From the outset Adrienne and Kerry were prompt with quotes and answers to a few questions we posed. 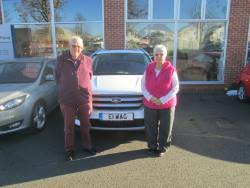 They were knowledgeable and friendly , which made us feel comfortable with using CarWow again. 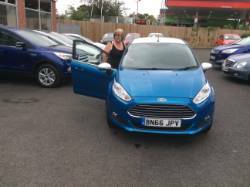 I definitely will use Both Adrienne and Kerry again and can’t recommend CarWow enough. 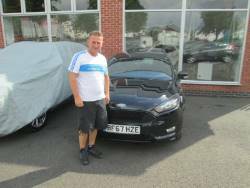 Mark Friendship was the salesman who dealt with me and the whole experience was excellent, there is nothing that I could think of that could be improved. 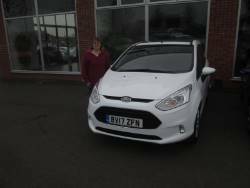 Adrienne was very professional, gave us a very good deal and made the whole process easy. 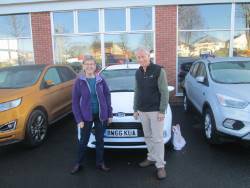 The new car arrived ahead of schedule and the handover process was smooth. 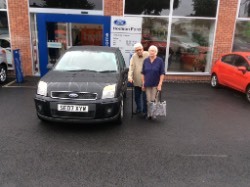 A very pleased Mr Snape taking delivery of his Ford Focus from salesman Mark Friendship at Hodsons. 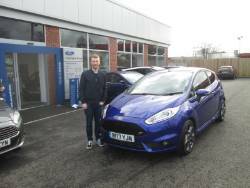 A very happy Mr Dubock collecting his Ford Fiesta from Mark at Hodson Ford. 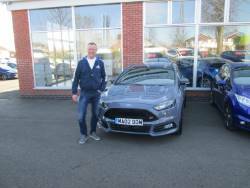 Collecting his 68 plate Ford Focus from Mark Friendship at Hodson Ford. 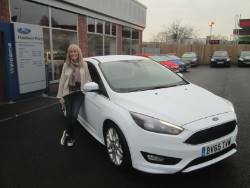 We dealt with Adrienne who was first class in her approach and could deliver the car we required without any sales pressure, very mature and professional throughout the sales process. 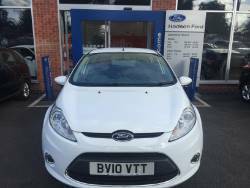 What an easier way of finding the right car and at the right price. 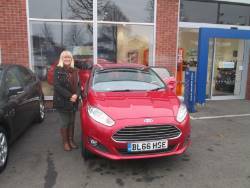 Adrienne, the sales lady for Carwow, was a friendly rep and helped us ensure that this was the car for us, without the usual high pressures of a sales person. I don’t think I’d buy a car any other way in the future, such a pleasant experience. To Richard and all the team. Really great job, looks like the brand new van it was . A perfect repair and paint job by Hodson. 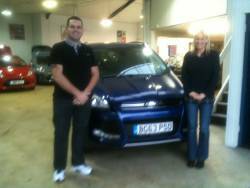 Many thanks for super service and very highly skilled job from pick up to repair to delivery today. 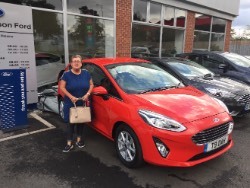 Fantastic customer service from Adrienne and Kerry, sorting finance and ordering my new car was made so easy with timely and helpful response given to any questions I had. 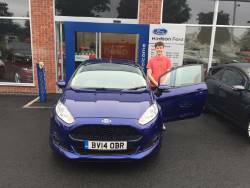 I would highly recommend Hodson Ford and can say with out a doubt this has been the best service I have received from any car dealership. 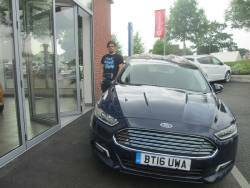 Was a very welcoming friendly atmosphere at the dealership and really enjoyable test drive too. 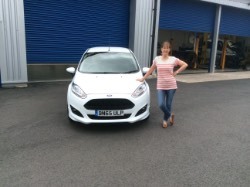 Very much looking forward to collecting my new fiesta in July. 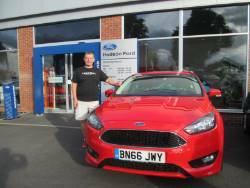 Top marks to Hodson Ford. 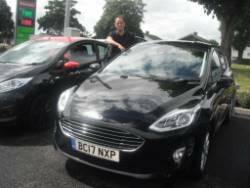 Car Wow will get good recommendations from me also fantastic deal all round. 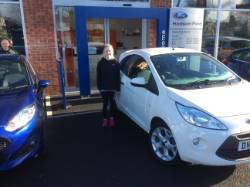 "Bought Eco Sport, Kerry was fabulous and made buying a car very easy...in fact so easily it feels strange. 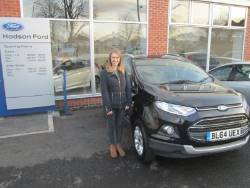 Thanks Kerry"
Great deal on a Ford Ecosport Zetec from Adrienne & Kerry. 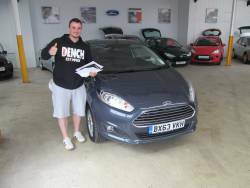 Very quick response to all questions and kept me fully up to date throughout the purchase process. 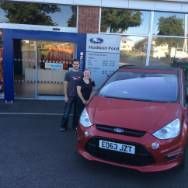 I purchased via Hodson Ford about 8 months ago and they were equally helpful, good price, easy process etc. 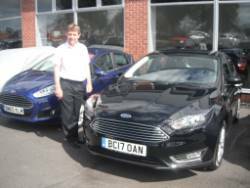 I would be happy to recommend Car Wow and Hodson Ford. 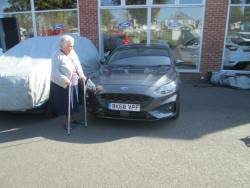 Alternatively my local Ford dealer told me to come in to see them as they would beat any deal. 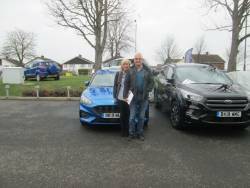 I wasted my time going to see them as they didn't get close to Hodson Ford's price. 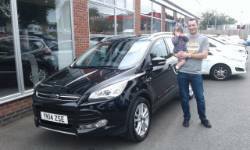 Andrew and his daughter collecting their new Ford Kuga from salesman Ross at Hodsons. 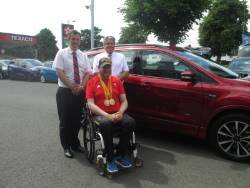 Today at Hodson Ford we were extremely lucky and proud to handover a new Ford Kuga to John Walker MBE and double Gold Medal winning Archer in the 2016 Para Olympics. 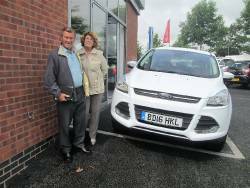 David Haynes Sales Advisor and Tony Jackson Dealer Principal are here with John and his new Kuga. Both David and Tony commented what a calm and inspirational Gentleman John is, and "YES" those Medals really do feel like their weight in Gold. 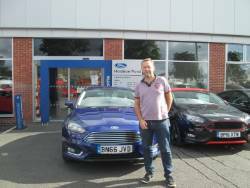 We have been coming to Hodson Ford for 10 years to see Mark Friendship an excellent salesman who always gives us first class service and we think of him as a friend, very trustworthy. 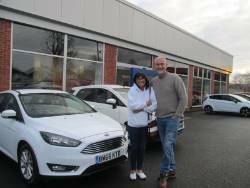 Pity the dealership is not nearer where we live but we will always use Hodson Ford. 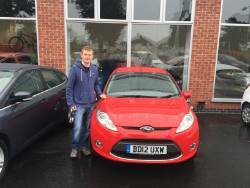 I dealt with salesman Mark Friendship and I received excellent service throughout the process of buying a new car. Mark really lived up to his name! Always friendly, courteous and extremely helpful. 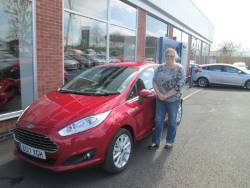 A very happy Mrs Bowman collecting her Ford Fiesta from salesman Ross at Hodsons. 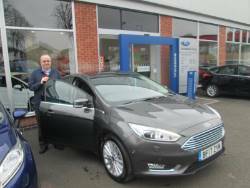 Our very own Paul collecting his new Ford Focus from Brian! 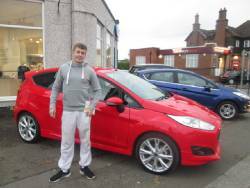 Mitchell collecting his Ford Fiesta from Brian at Hodsons. 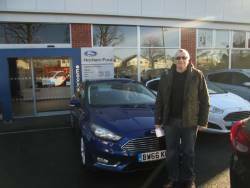 "Mark Friendship is the reason we keep coming back to Hodson Ford. 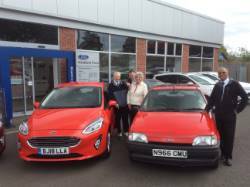 This is the third car we have purchased from Mark and we have also introduced other members of our family to him." 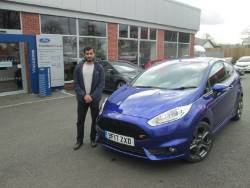 "I dealt with salesman Mark Friendship and received excellent service off Mark throughout the process of buying a new car. 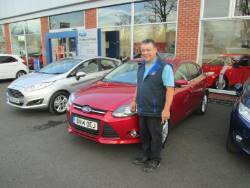 Mark really lived up to his name and was friendly, courteous and very helpful at all times. 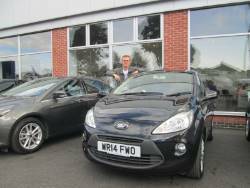 I would not hesitate recommending anyone to buy their car from Mark. FIRST CLASS!" 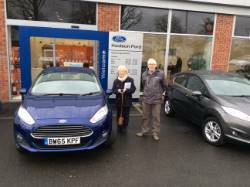 A very happy Mr and Mrs Randle collecting their new Ford Fiesta along side the car they are trading in! 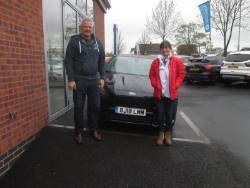 A very happy Shannon collecting her BMW from Brian at Hodsons. 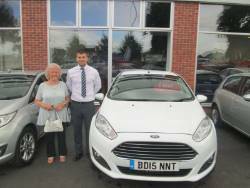 A very happy Mr and Mrs Holmes collecting their Ford Fiesta from salesman Ross at Hodsons. 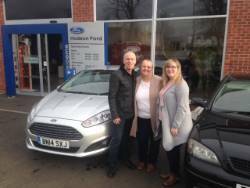 Ron collecting his Ford C-Max from Adrienne and Kerry at Hodsons. 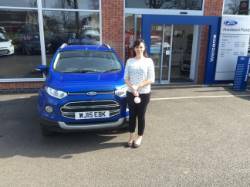 Alice collecting her brand new Ford Ecosport from Adrienne and Kerry at Hodsons. 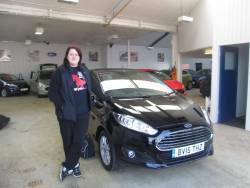 A very happy Lisa collecting her Ford Fiesta from Brian Smith at Hodsons. 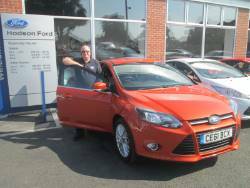 Paul taking delivery of his new Ford Focus in Tangerine Scream from Mark at Hodson Ford. 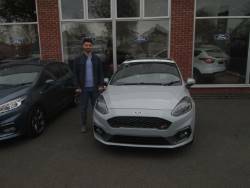 A very happy Mr Santisook collecting his Ford Fiesta from Mark Friendship at Hodson Ford. 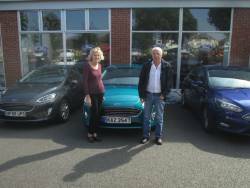 Mr and Mrs LeMaistre picking up their new Ford Fiesta from Mark at Hodsons. 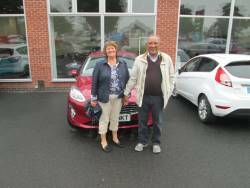 Mr and Mrs Jones taking delivery of their new Ford Fiesta from Mark Friendship at Hodsons. 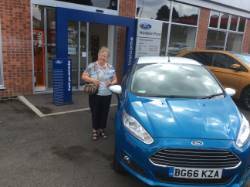 Marilyn collecting her brand new Ford Focus from Mark at Hodsons. 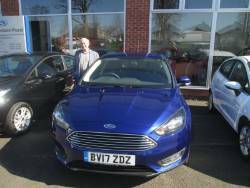 A very pleased Mr Greenaway picking up his brand new Ford Fiesta from Brian at Hodsons. 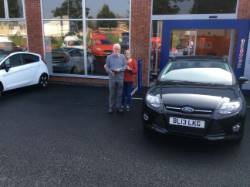 Mr and Mrs Craddock collecting their Ford Focus from salesman Brian Smith at Hodsons. 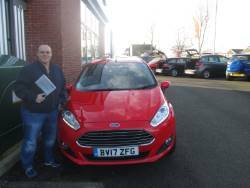 A very happy David taking delivery of his Ford Fiesta from Brian at Hodsons. 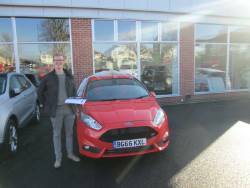 Alex collecting his Ford Fiesta from Brian at Hodsons. 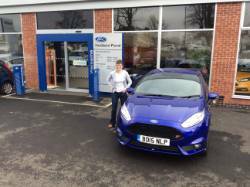 I will definitely recommend both Hodson Ford to anyone who is thinking of buying a car. 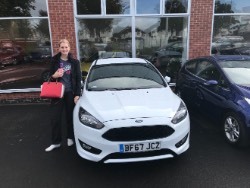 The help and service I received so promptly from Adrienne at Hodson Ford was really first class, all my questions about the car and extras I asked for were answered quickly and honestly which gave me confidence in deciding to complete the purchase of the car. Thank you Adrienne and Kerry. See you again in 2 Years. The most straightforward and professional way I have ever bought a new vehicle. Adrienne and Kerry are very easy to deal with. The deal on the vehicle was also the most competitive. I would highly recommend. 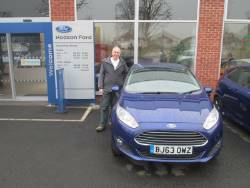 A very happy David collecting his Ford Fiesta from Brian Smith at Hodsons. They took their time and did not pressure me until I was ready to buy. Very happy with the way they do things. I would be very happy to recommend them. 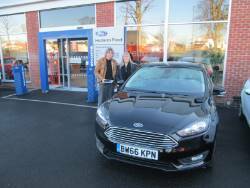 Very impressed with Hodson Ford Penkridge. If you want efficient easy way to buy your next car use them. 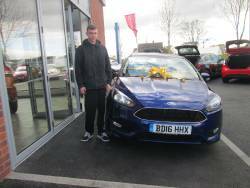 Dan taking delivery of his new 18 plate Ford Focus from Mark at Hodsons. 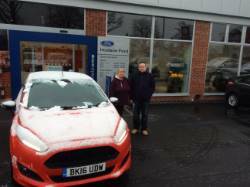 Ray Peake Hodson's first Customer to collect his new 18 plate Kuga from Adrienne & Kerry on this very snowy March 1st morning. 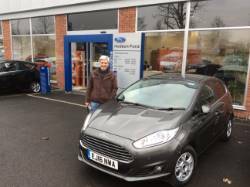 Louise taking delivery of her brand new Ford Fiesta from Mark at Hodson Ford. 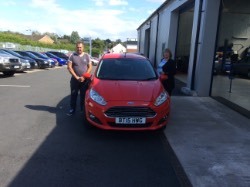 Mark taking delivery of his Ford Fiesta from Brian at Hodsons. 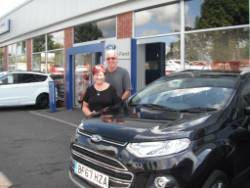 Jerry collecting her Ford Ecosport from Brian at Hodson Ford. 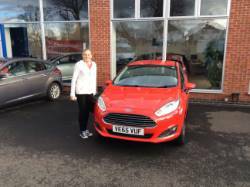 A very happy Miss Dyke collecting her Ford Fiesta from Mark Kilgallon at Hodsons. 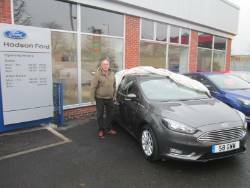 John picking up his Ford C-Max in Tectonic Silver from Mark Friendship at Hodson Ford. 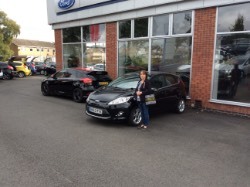 Julie collecting her new Ford Fiesta from Mark at Hodsons. 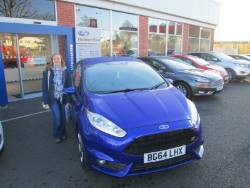 Sharon taking delivery of her brand new Ford Fiesta ST-Line in Blue Wave from salesman Mark Friendship at Hodson Ford. I would definitely recommend them . It did not matter whatever detail i asked for they provided the answer , test drive etc they even suggested items i had forgot . they were very friendly , polite & certainly did not try to push the business . they gave me prices on all the options i asked for & left me to make my own mind up. 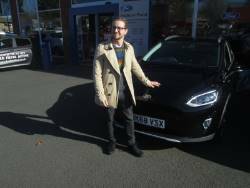 It was certainly the best car buying experience i have ever had. Brilliant first time experience after using Evans Halshaw and Furrows previously. Everything asked was dealt with in a very professional manor. Will definitely use again. 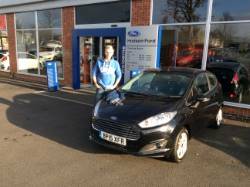 Matthew collecting his Ford Fiesta from Brian at Hodson Ford. 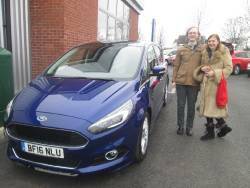 'Just thought I should give genuine thanks to the Hodson Ford team (Adrienne and Kerry-Anne) who recently helped me buy my new Focus. 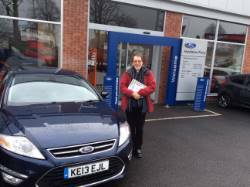 The scrappage scheme, and the fact that my previous Focus was 10 years old, were both influences on my decision to assess options via Carwow - but as someone who is self-employed, home-based and lives yards from Albrighton station, I hadn't 100% made up my mind to buy. 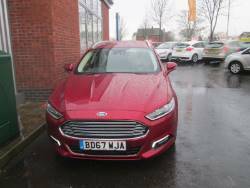 However, I found Carwow remarkably easy to navigate, and was impressed that your duo were in touch with an excellent offer inside 10 minutes ... whereas the other four offers came in almost 24 hours later. 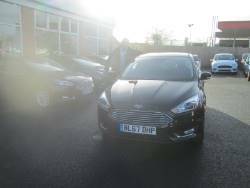 My subsequent inquiries, by phone and mail, re options, spec and cost were dealt with in real-time, which equally impressed. 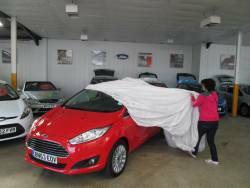 Updates re the car's progress from Barcelona to Penkridge - likewise. 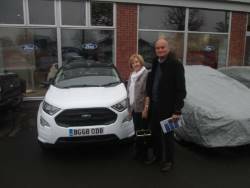 Finally, the handover process was as efficient as could be, and the gentle nudges to think about purchasing Ford insurance and taking out a Hodson service plan, persuaded me to purchase both in the following days, once I'd carefully vetted them against my existing deals. As a freelance business journalist, communications is a core issue for me, and I particularly liked the way Adrienne and Kerry-Anne dovetailed, so if one didn't immediately, the other did. 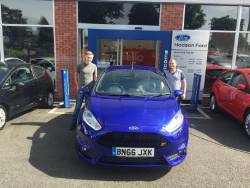 A very happy Aidan picking up his new Ford Fiesta from Mark at Hodsons. 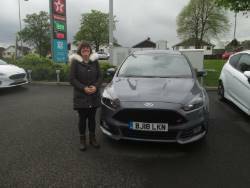 A very satisfied Sophie taking delivery of her Stealth Grey Ford Focus from Mark Friendship at Hodsons. 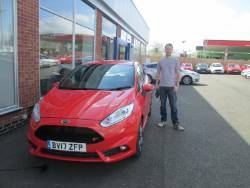 A very happy Liam collecting his new Ford Fiesta Zetec from Mark at Hodson Ford. 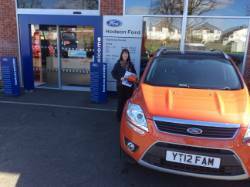 Michelle picking up her new Ford Kuga from Mark Friendship at Hodsons. 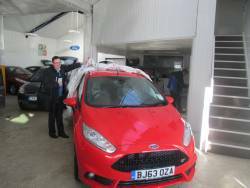 Roland taking delivery of his Ford Fiesta from Salesman Mark at Hodsons. 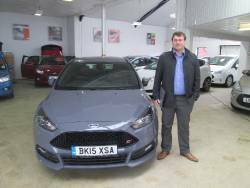 A very happy Craig collecting his brand new Ford Focus from Mark Friendship at Hodsons. 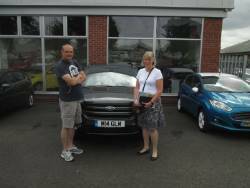 Mr and Mrs Gibbons collecting their new Ford C-max from Brian at Hodsons. 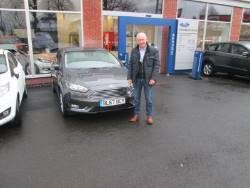 John picking up his Ford Fiesta from Brian at Hodsons. 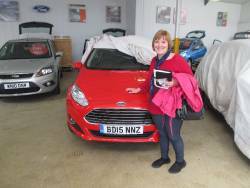 Susan picking up her brand new 67 reg Ford Fiesta from Mark at Hodsons. 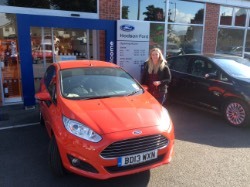 Sarah collecting her brand new Ford Fiesta From salesman Mark Friendship at Hodsons. 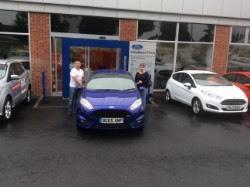 Sharon and Carl picking up their new Ford Fiesta from Mark at Hodsons. 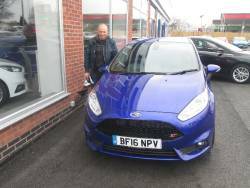 John collecting his new Fiesta from Mark at Hodson Ford. 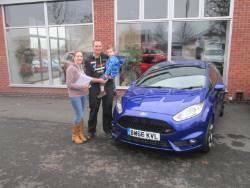 Julie and her son taking delivery of their brand new Ford Fiesta from Mark Friendship at Hodsons. 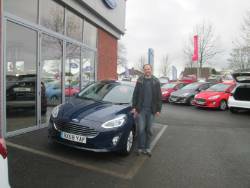 Mark Friendship was a lovely salesman to deal with. 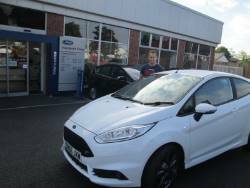 The whole process went smoothly and I couldn't fault anything about my experience. I really liked the waiting room too! 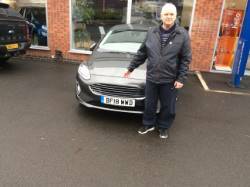 The Salesman, Mark Friendship was very professional, very knowledgeable and made the whole process of buying the car very easy. 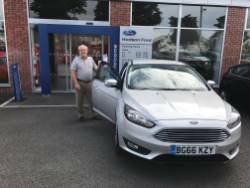 This is the fourth car I have purchased from Hodson Ford (Mark Friendship) and they have always provided excellent service. I wouldn't hesitate recommending this dealership. 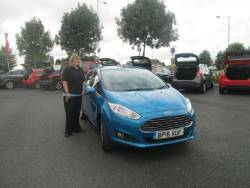 Miss Smith collecting her new Ford Fiesta from Mark Friendship at Hodsons. 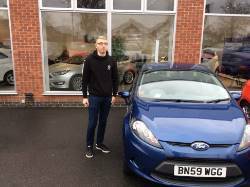 Matt commentated:- Very quick response on first enquiry and others, no hard sell, no time pressure, polite, a good price compared to others, really glad I used Carwow, satisfied customer. 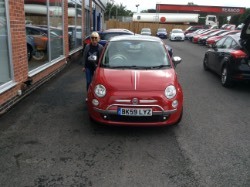 Hodson's Sales Administrator Katie collecting her Fiat 500 from Dave "Very excited"
Kevin commented:- I would highly recommend Hodson Ford when buying a vehicle. 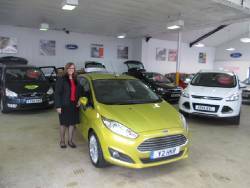 Adrienne is very friendly and knowledgeable, & does not pressurise you into buying something you don't want. 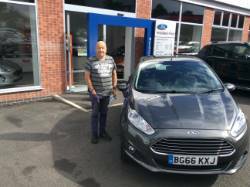 A very happy David collecting his Ford Focus from Brian Smith at Hodson Ford. 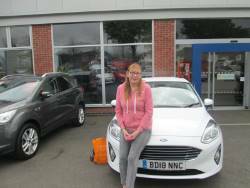 "Kerry was very helpful and made the process so easy. 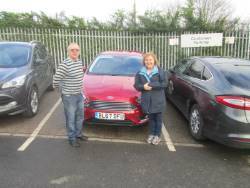 This is the 2nd car my family have brought from Kerry and the service is always first class." 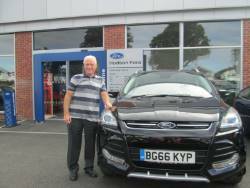 John picking up his Ford Focus from Brian Smith at Hodsons. 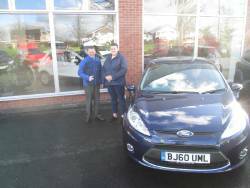 Helen collecting her Ford Fiesta from Brian Smith at Hodsons. 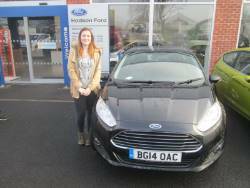 A very excited Lucy picking up her Ford Fiesta from Brian at Hodson Ford. 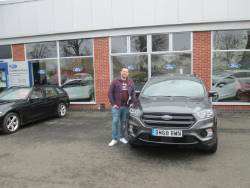 A very happy Andy taking delivery of his Ford Kuga from Brian Smith at Hodsons. 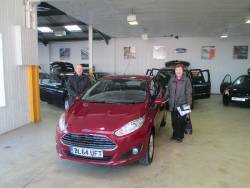 Mrs McLennan taking delivery of her brand new Ford B-Max from Brian at Hodson Ford. 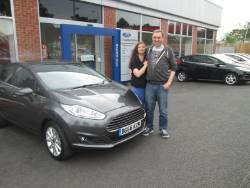 A very happy Becky collecting her Ford Fiesta from Brian at Hodsons. 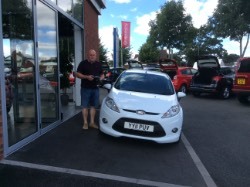 A very happy Andrew collecting his brand new Ford Ka+ from Mark Friendship at Hodsons. 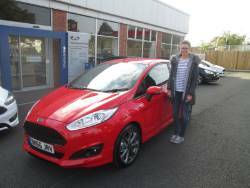 A very happy Rachel taking delivery of her Ford Fiesta from Brian Smith at Hodsons. 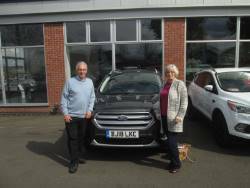 A very happy Mr and Mrs Clewley collecting their Ford Kuga from Brian at Hodsons. 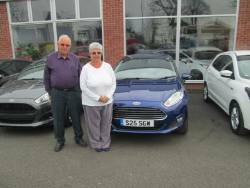 Mr and Mrs Lyons picking up their new Fiesta from Brian at Hodsons. 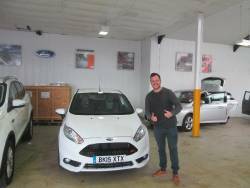 A delighted Richard collecting his new Fiesta from Rob at Hodson’s. Can you spot Mr Fox? 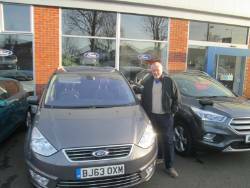 A very pleased John collecting his brand new Kuga from Mark at Hodsons. 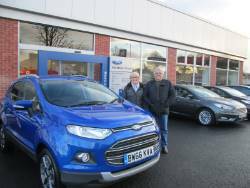 A very happy Carol and Steve Moffatt picking up their brand new Ford Ecosport from Mark at Hodsons. 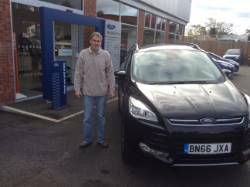 Mr Dave Wadeley taking delivery of his 67 reg Kuga from Mark Friendship at Hodsons. 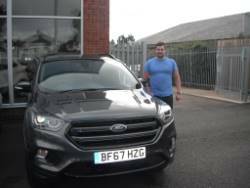 Darren collecting his new Kuga from Mark at Hodson Ford. 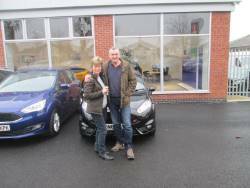 A very happy Mr and Mrs Poxon collecting their brand new Ford Focus from Mark Friendship at Hodsons. 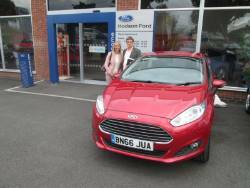 "Have to give Hodson Ford Penkridge five stars by all criteria. Responded to my initial inquiry (and subsequent ones) within minutes ... and almost 24 hours ahead of all other Ford dealers. Liked how Adrienne and Kerry dovetailed, so if one wasn't there, the other helped me. 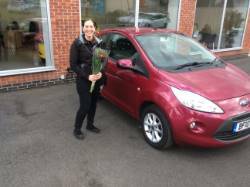 Thanks to them, I went from first inquiry to completing my purchase in less time than it would have taken me to drive from my home (Albrighton) to Penkridge"
A very happy Sarah collecting her Ford Ka from Brian Smith at Hodsons. 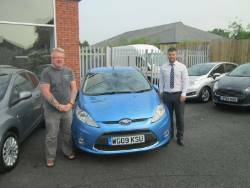 Mr Cousins collecting his Ford Focus Zetec from Brian at Hodson Ford. 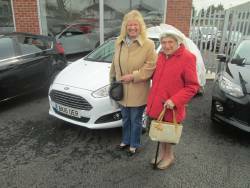 Mrs and Mrs Owen picking up their Ford Fiesta from Brian at Hodsons. 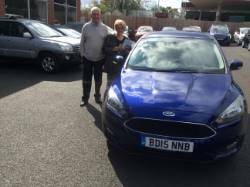 A very happy Mr and Mrs Law collecting their Ford Focus from Brian at Hodsons. 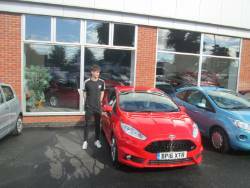 Good experience at Hodson ford. Test drive good distance and many questions answered. 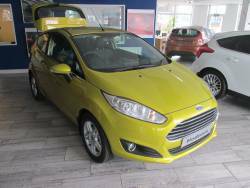 No problem in matching suggested price and all done without any hassle. 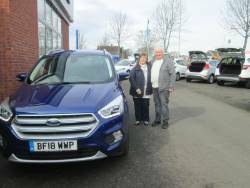 The first 67 plate to leave Hodson Ford. 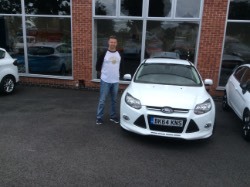 A very excited Matt Irvin collecting his Kuga from Mark Friendship. 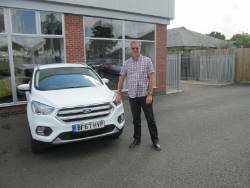 "I dealt with salesman Mark Friendship and I received excellent service from Mark throughout the process of buying a new car. 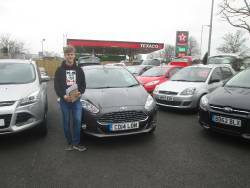 Mark really lived up to his name and was friendly and courteous and very helpful at all times." 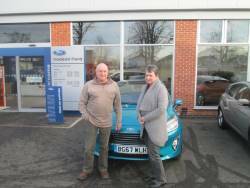 "Mark Friendship was very helpful, great guy to deal with." 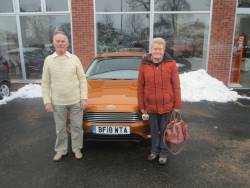 "Mark Friendship made the experience as smooth as it could be for us. 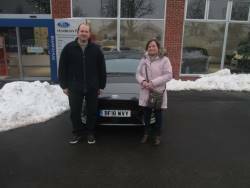 He completed all of the paperwork efficiently and professionally and seemed to be as excited as we were at the prospect of us getting a new car." 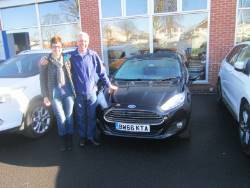 A very happy Nigel collecting his new Fiesta organised by Adrienne and Kerry. 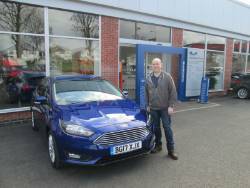 A very happy Mr Sammons taking delivery of his Ford Mondeo from Brian Smith at Hodsons. 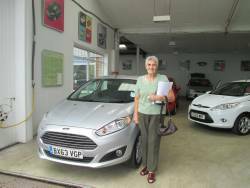 A very pleased Patricia collecting her Fiesta from Brian at Hodsons. 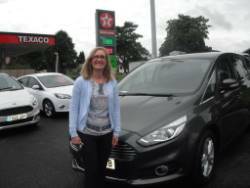 Mrs Brain collecting her new Ford S-Max from Mark at Hodsons. 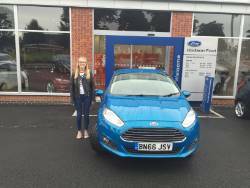 A very excited Emily taking delivery of her brand new Ford Fiesta from salesman Mark Friendship at Hodsons. 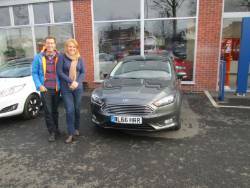 A very happy Jack and Lydia picking up their Focus from Dave at Hodsons. 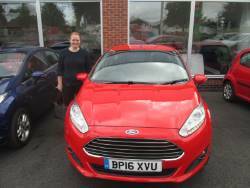 A very pleased Miss Appleby taking delivery of her Ford Fiesta from salesman Brian at Hodson Ford. 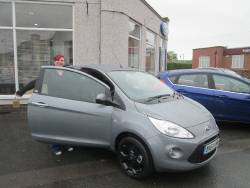 Very good deal offered, quick responses to my messages, very efficient on the phone and I am very happy with the car I have ordered and the price paid. 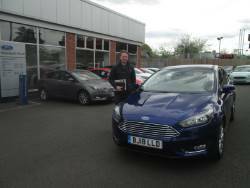 A very happy Mr Hall collecting his brand new Ford Focus from salesman Mark at Hodsons. 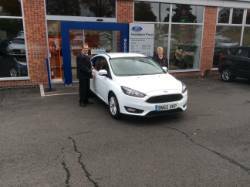 A delighted Mr Toor taking delivery of his new Ford Focus in the colour Frozen White from Mark at Hodsons. 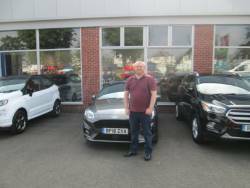 Mr Paul Williams collecting his brand new Ford Fiesta in Shadow Black from salesman Mark Friendship at Hodson Ford. 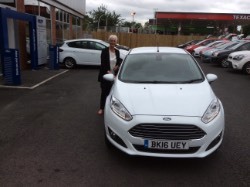 A very pleased Miss Till picking up her Ford Fiesta from Brian at Hodsons. 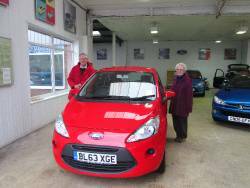 A very happy Mr and Mrs Johnson taking delivery of their brand new Ford KA+ from salesman Brian Smith at Hodsons. 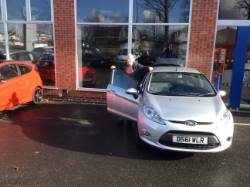 Mr Whitehouse collecting his Ford Fiesta from Brian Smith at Hodson Ford. 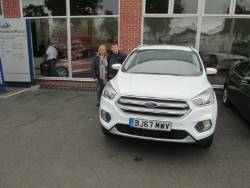 A very pleased Mr Palmer collecting his Ford Kuga in white from Brian Smith at Hodsons. 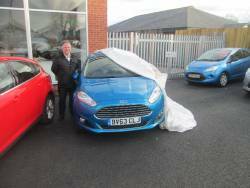 A very happy Mr Poole taking delivery of his Ford Fiesta from Brian Smith at Hodson Ford. 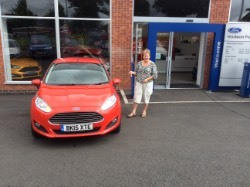 A very pleased Mrs Sheena Bisbey taking delivery of her Ford Fiesta in red from salesman Brian Smith at Hodson Ford. 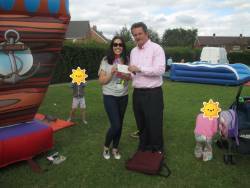 Tony Jackson from Hodson Ford presenting Marshbrook PTA Chair, Yvonne Blackhurst, a cheque in support of the Marshbrook fete. 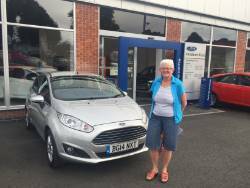 A very happy Mrs Gooding taking delivery of her Ford Fiesta from salesman Brian Smith at Hodson Ford. "What went well? 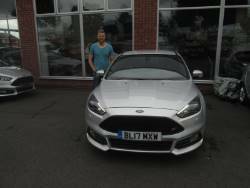 Everything from the very first phone call to a top bloke called Mark Friendship, this chap was incredible start to finish, super speedy service kept tings nice and simple for me, I couldn't be happier, Mark deserves some reward and recognition for his excellent service. What could have been improved? Nothing I cannot recommend highly enough, please pass this on to Mark for me. 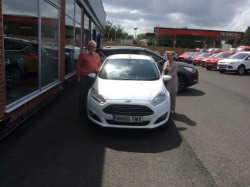 Kind Regards, Steven Brain"
"We have bought many cars from Hodson Ford and always receive an excellent service from salesman Mark Friendship and have recommended Hodson Ford to several family members who have all subsequently purchased a car from Mark Friendship due to excellent price and service." Mr Faulkner also left a lovely review about Kerry. 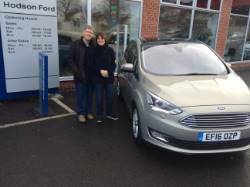 'I picked up the Focus today from Adrienne so didn’t have chance to thank you. Fantastic showroom! Very friendly staff. Ordering process was simple, done by Adrienne. 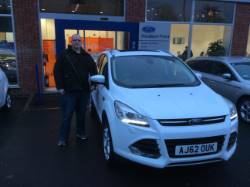 Very happy with the cost of my new Kuga and the px price for my car. Would recommend them to anyone. Hodson's of Penkridge was recommended to me by a friend. I can only say that this was well justified. The showroom /facilities were first class.. 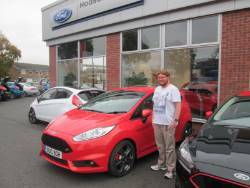 The staff were very friendly and helpful and certainly not 'Pushy' which I have to say is something I really dislike. The lady salesperson who dealt with me was Adrienne Haynes........I found her to be extremely pleasant . She was most helpful and very professional not to mention patient. My new car is now on order and I look forward to taking possession of it. 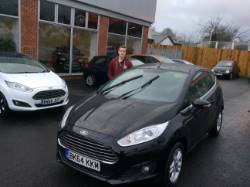 Having dealt with numerous garages/salespersons I found dealing with this establishment a very pleasant experience and I would have no hesitation in recommending them!! 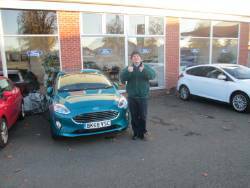 A lovely review about salesman Mark Friendship. "You can't improve with the best salesman Mark Friendship'. 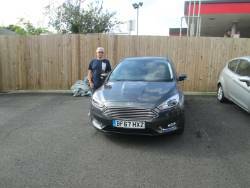 This was second new car I have purchased from Hodson Ford and it was every bit as pleasurable as the first time around. The communication with Adrienne and Kerry was speedy and informative and despite the fact I ask A LOT of questions, I never got the impression that I was putting them out and nothing was too much to ask. I was kept updated as my Focus was built and the whole process was easy and a pleasurable experience. I got a good price on my part exchange too which is also a nice bonus! 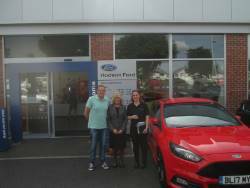 I highly recommend Hodson Ford, Adrienne and Kerry in particular. 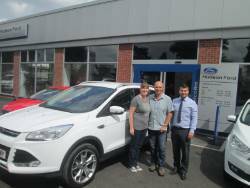 A very pleased Mr + Mrs Jones picking up their brand new Kuga from Adrienne at Hodson Ford. 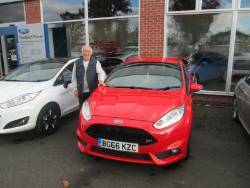 A very happy Mr Ron Halfpenny collecting his 17 plate Ford Fiesta from Mark Friendship at Hodsons. 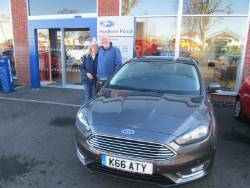 A very happy Mr Richard Cartwright taking delivery of his brand new 17 plate Ford Focus with his dad from Adrienne at Hodson Ford. 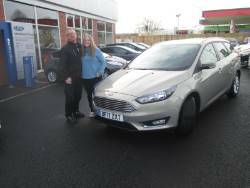 A very happy Mr and Mrs Charters taking delivery of their new Ford Focus from salesman Brian at Hodsons. 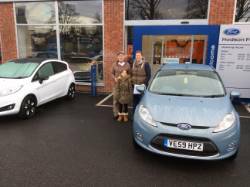 Andrea collecting her new B-Max from Adrienne and Kerry at Hodson Ford after ordering it all the way from Kuala Lumpur -- That's what you call a distance sale!!!!!!! Such a refreshing experience. 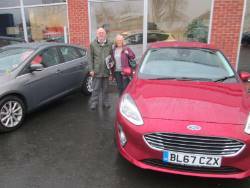 Adrienne and Kerry kept us informed throughout the whole process and did everything to ensure I got the new Focus by 31 March. 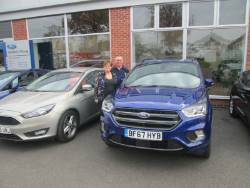 We will definitely be using carwow and Hodson Ford in the future. So happy with the new car. 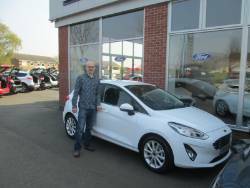 This is the very first time that I have ordered a brand new vehicle and as I live a long way from the dealership all communication was done via e-mail or over the telephone. 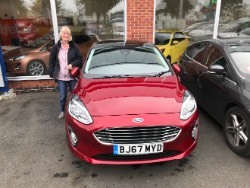 Adrienne and Kerry were able to deal with all my queries and were most helpful in finding exactly what I wanted, without Carwow's introduction I would never have found this friendly dealership who have made everything so easy, full marks to everyone who played a part in this process. I would definitely recommend this route to finding a new car. 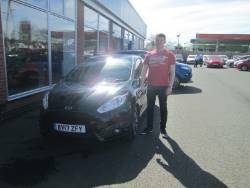 I bought my Ford Fiesta ST3 from Hodson Ford Penkridge. 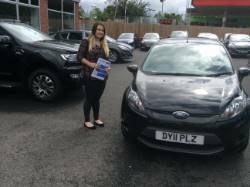 Adrienne and the team were very quick to respond and extremely helpful throughout. They were more than happy to answer any questions I had. At no point were they pushy or did I feel pressured to buy the car. 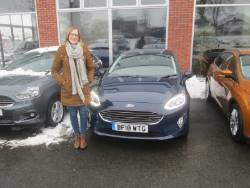 Once I decided which car and with what extras I wanted, Adrienne made the process of ordering the car extremely easy and kept me updated with the delivery date. I saved over £4,000 off the list price. 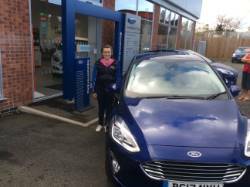 I was extremely happy with the service I had and would highly recommend both Carwow and Hodson Ford Penkridge. "I don't think you can improve!! 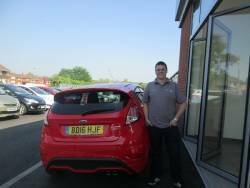 We were treated like one of the family, Mark is a very special sales person. 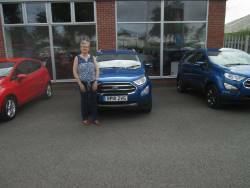 This is the 2nd car that we have brought from Hodson Ford if we upgrade we will certainly give Mark our business"
"The whole process from start to finish was easy going and Mark was very helpful and informative answering all my questions and queries"
A very happy Mrs Laplanche taking delivery of her Ford Ecosport from Brian Smith at Hodsons. 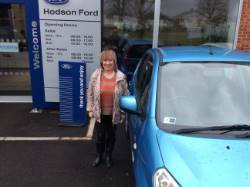 A happy Miss Emms picking up her Ford KA from Brian at Hodsons. 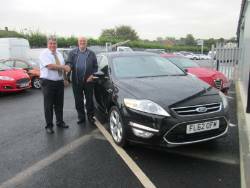 A pleased Rev Chris Coupe collecting his Ford Mondeo from salesman Brian Smith at Hodson Ford. 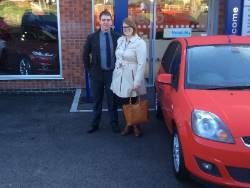 A very happy Mrs Harvey taking delivery of her Suzuki Splash from salesman Brian at Hodson Ford. 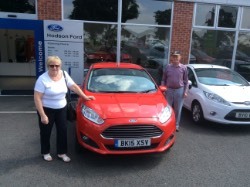 Mervyn collecting his second new Fiesta from Adrienne & Kerry at Hodson Ford - Thanks for the chocolates Mervyn! 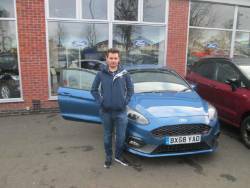 "Mark Friendship Sales Exec was so professional with the whole experience of buying my car, I recommended my son who also p/exchanged his Fiesta purchased through Bristol Street Group and buy from Hodsons which he did. 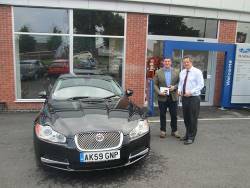 Well done Mark, I am not easily impressed working for JLRPR team, however you managed this that I recommended my son." 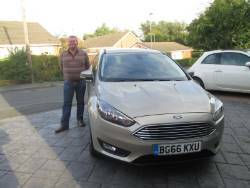 "Mark Friendship was very helpful as always, our fourth car from Mark and he never fails to find us the right one." 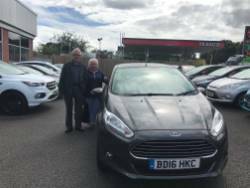 "This is our third car from Hodsons and each time we have had a great service from salesman Mark Friendship, many thanks." 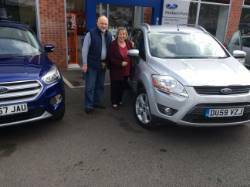 A very happy Mrs Sally Hadley collecting her Ford Kuga from Brian at Hodsons. 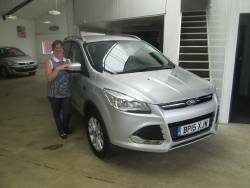 A very happy Mrs Baker taking delivery of her Ford Kuga from Brian Smith at Hodsons. 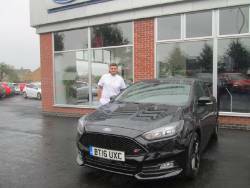 Mr Davies collecting his Ford Focus ST3 in Stealth from salesman Brian Smith at Hodson Ford. 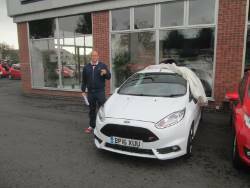 A very pleased Mr Walker collecting his Ford Fiesta ST2 from Brian Smith at Hodsons. 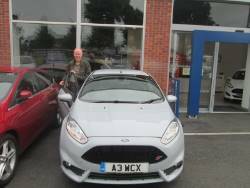 A very happy Mr Armstrong taking delivery of his Ford Focus ST2 from salesman Brian at Hodson Ford. 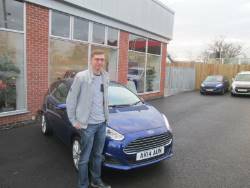 A very happy Mr Matt Hillary taking delivery of his Ford Fiesta Zetec from Brian at Hodson Ford. 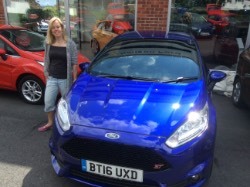 A very happy Mrs Reading taking delivery of her new Ford Fiesta ST2 from Brian at Hodson Ford. 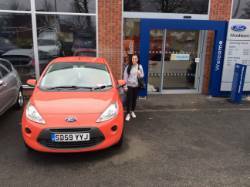 A very happy Miss Chloe Lunn taking delivery of her Ford KA from Brian at Hodsons. 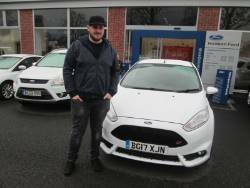 A very happy Mr Ryan Astbury taking delivery of his Ford Focus ST-2 in white from salesman Dave at Hodson Ford. 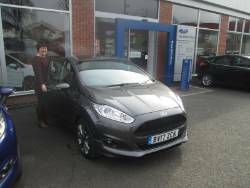 A very excited Mr Daniel Burton taking delivery of his Ford Fiesta from salesman Brian Smith at Hodson Ford. 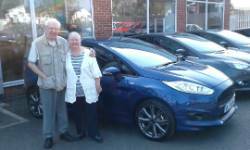 A very pleased Mr and Mrs Smith taking delivery of their new Ford Fiesta from Brian Smith at Hodsons. 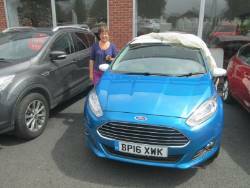 A very happy Miss Pendleton taking delivery of her new Fiesta Zetec from salesman Brian Smith at Hodson Ford. 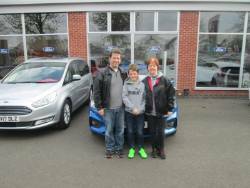 A very excited Mr and Mrs Stone and Family collecting their new C-Max from Brian at Hodsons. 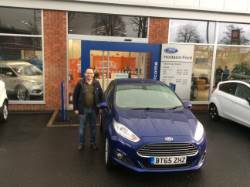 A very happy Mr Alan Preece collecting his new Ford Fiesta from salesman Brian Smith at Hodson Ford. 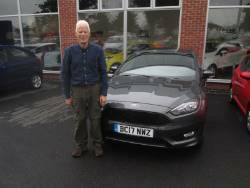 A delighted Mr Robert Rodgers taking delivery of his Ford Fiesta from salesman Brian Smith at Hodsons. 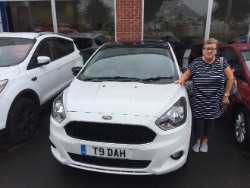 A very happy Miss Barker collecting her new White KA from Brian at Hodson Ford. 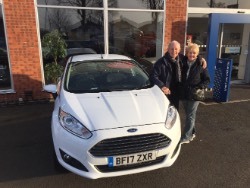 Mr and Mrs Jones Picking up their White Ford Fiesta Zetec together from Brian at Hodsons. 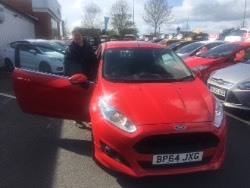 Mr Richard Green picking up his Ford Fiesta Zetec in Red from Brian Smith at Hodson Ford. 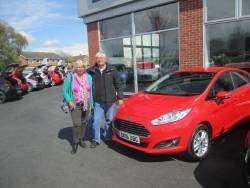 A very excited Mr and Mrs Morgan collecting their brand new Ford Fiesta in red from Brian Smith Here at Hodsons. 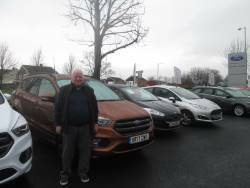 A very happy Mr Royce taking delivery of his new Ford Kuga from salesman Brian Smith at Hodson Ford. 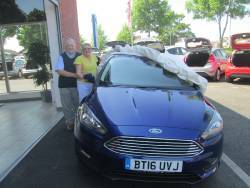 A very happy Mr and Mrs Barrett taking delivery of their brand new Ford Focus in Deep Impact Blue from Mark Friendship at Hodson Ford. 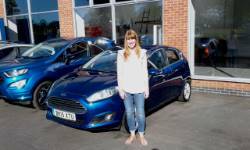 A happy Laura Wood collecting her Ford Fiesta Zetec S from salesman Brian Smith at Hodson Ford. 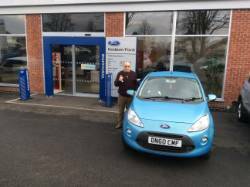 An extremely pleased Mr Price taking delivery of his Ford KA Zetec from salesman Brian Smith at Hodsons. 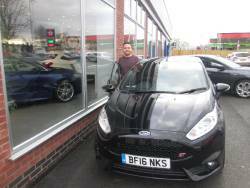 A very happy Mr Adam Hill taking delivery of his brand new Ford Focus ST3 from Mark Friendship at Hodson Ford. 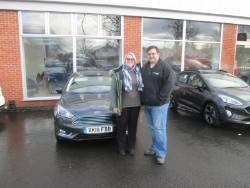 A very excited Mrs Dawson picking up her brand new Ford Focus from salesman Mark Friendship here at Hodsons. 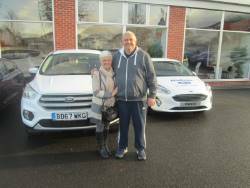 A delighted Mr and Mrs Manton collecting their brand new Ford Fiesta in white, from salesman Mark Friendship at Hodsons. 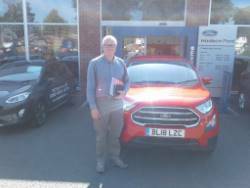 A very pleased Mr Wilson taking delivery of his brand new Ecosport from Mark Friendship at Hodson Ford. 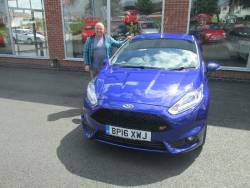 A very happy Mr Browne taking delivery of his new Ford Fiesta Titanium in Deep Impact Blue, from salesman Brian Smith at Hodsons. 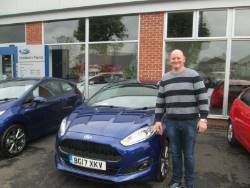 A very happy Mr Latham collecting his Ford Fiesta from Brian Smith at Hodsons. 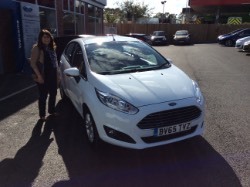 A very happy Taryn collecting her new Fiesta from salesman Dave Haynes at Hodson Ford. 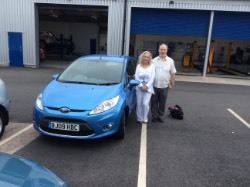 A very happy Mr and Mrs Randles collecting their Ford Fiesta Zetec from salesman Brian Smith at Hodson Ford. 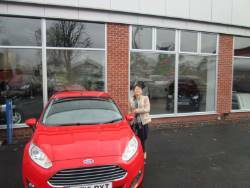 A very happy Mrs Ting Ma Murphy taking delivery of her Ford Fiesta from salesman David Haynes. 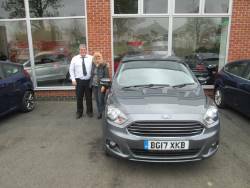 James and Nicola collecting their new Ford Focus from Adrienne at Hodson Ford. 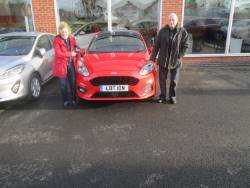 Mr Ronald Halfpenny said - "Nothing could have been improved"
A very pleased Mrs Piearce from Birmingham taking delivery of her new Fiesta in Candy Red from salesman Mark Friendship at Hodsons. 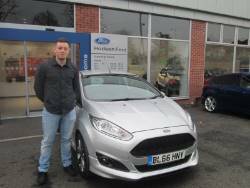 A very happy Tyler collecting his brand new 66 plate Fiesta ST-Line from salesman Mark Friendship at Hodson Ford. 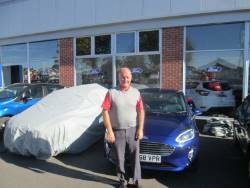 A very happy Mr Gregory taking delivery of his Ford Fiesta from salesman Brian Smith at Hodson Ford. 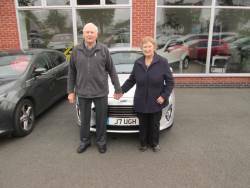 Mr Peter Illingworth - "Mark Friendship made us feel at ease while making an important purchase and the associated decisions"
Mrs Hazel Lockett - "I had a very good service from Mark the salesman that dealt with my husband and me. I don't think you could improve if they are all like him. 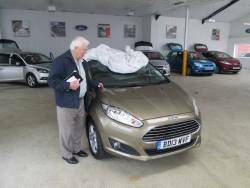 He has been helpful to us after the sale as we are older people and have had to get to know the cars computer and controls. 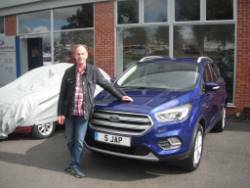 Could not be more helpful"
Mr Stephen Smith - "Mark Friendship was extremely helpful and made our experience a very good one!!" 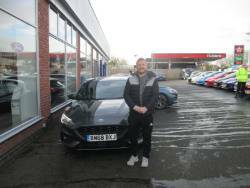 Mr James Ostle - "I dealt with the salesman Mark Friendship and I received excellent service off Mark throughput the process of buying a new car. 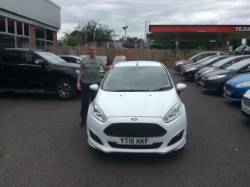 Mark really lived up to his name and was friendly and courteous and very helpful at all times"
A very happy Mr Stubbs taking delivery of his Ford Fiesta from salesman Brian Smith at Hodson Ford. 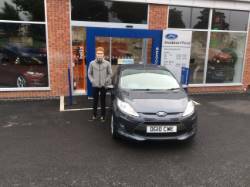 An extremely happy Adam Blakely collecting his surprise 21st birthday present, a Ford Fiesta Zetec, from salesman Brian Smith at Hodson Ford. 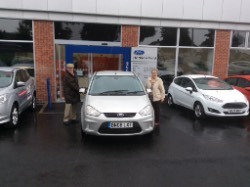 Ian with Katy collecting her new car from Adrienne at Hodson Ford. 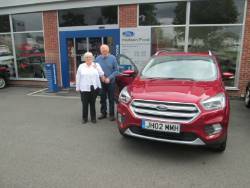 An extremely happy Mr and Mrs Halfpenny taking delivery of their brand new Ford Kuga from salesman Mark Friendship at Hodson Ford. 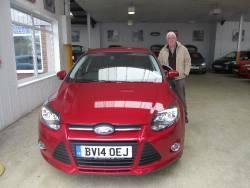 A very happy Mr David Palmer taking delivery of his brand new Ford Focus from salesman Mark Friendship at Hodson Ford. 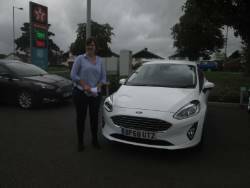 A very excited Miss Sarah Knights taking delivery of her brand new Ford Fiesta from salesman Mark Friendship at Hodson Ford. 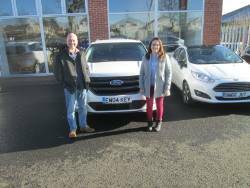 A very happy Mr Paul Foster collecting his brand new Ford Kuga alongside daughter Jessica Foster who is also collecting her brand new Ford Fiesta from salesman Mark Friendship at Hodson Ford. 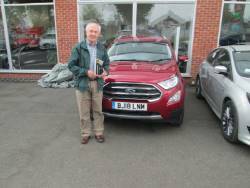 Mr Gittens said "It was a relaxing experience, made welcome, offered tea or coffee and treated with upmost respect, brilliant." 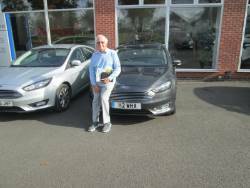 Mr Ostle said "I dealt with salesman Mark Friendship and I received excellent service off Mark throughout the process of buying a new car. 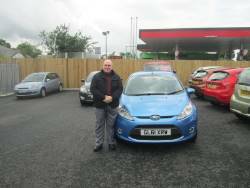 Mark really lived up to his name and was friendly and courteous and very helpful at all times." 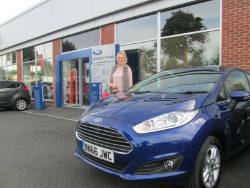 A very excited Miss Charlotte Wellsbury picking up her new Ford Fiesta from salesman Brian Smith at Hodson Ford. 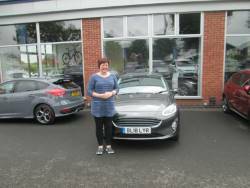 A very happy Mrs Tracy Howell collecting her new Ford Mondeo from salesman Brian Smith at Hodson Ford. 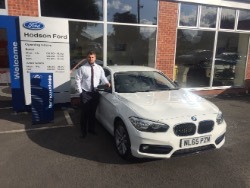 A very happy Mr Richard Normington taking delivery of his new BMW from salesman Brian Smith from Hodson Ford. 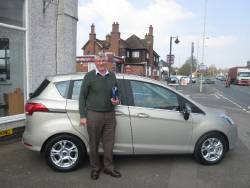 Mr Andrew Harborne said "Can't really improve an excellent service". 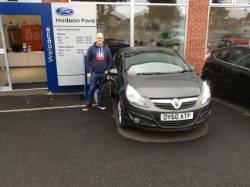 A delighted Mr Jones taking his delivery of his Vauxhall Corsa from salesman Brian Smith at Hodson Ford. 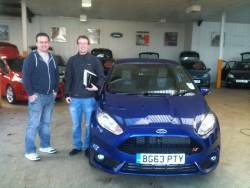 A very pleased Mr Schulz collecting his Fiesta ST 2 from Brian Smith at Hodson Ford. 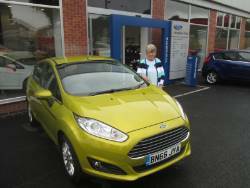 A very happy Mrs Boothby taking delivery of her new Ford Fiesta from salesman Brian Smith at Hodson Ford. 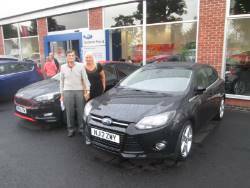 A very happy Mr and Mrs Langton collecting their new Ford Focus from our salesman Brian Smith, at Hodson Ford. 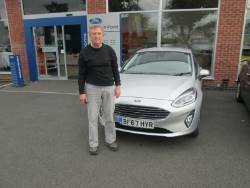 Mr Griffith said "Mark is a pleasure to deal with, very honest, a good guy, I believe he tries to offer the best deals available at the time". 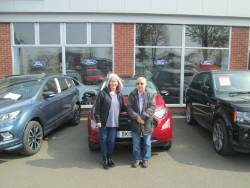 Mr Caines said "The salesperson Mark Friendship was excellent in every way, courteous, knowledgeable, everything was fantastic, he's a credit to Hodson's, he also makes a great cup of coffee!" 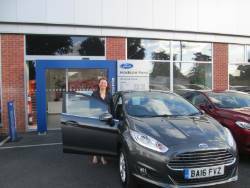 Miss Paula Boot taking delivery of her brand new Ford Fiesta automatic from our sales man David Haynes at Hodson Ford. 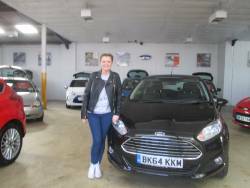 Miss Boot was very happy and said her experience was exceptional. 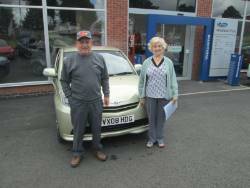 She also said all staff were very helpful and pleasant at all times. 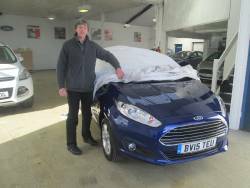 Mr Heys said "Salesman extremely professional. I have every confidence with my dealings with Mark. 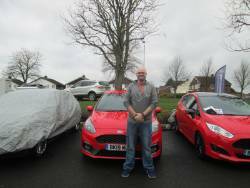 I have used Hodson Ford before and will definitely use again." 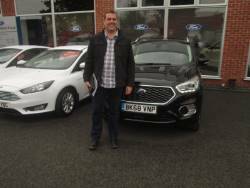 An excited Mr Harborne taking delivery of his brand new Ford Focus from Hodsons. 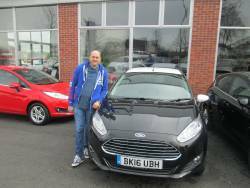 A very pleased Mr Dauncey collecting his 14 plate KA from our salesman Mark Friendship. 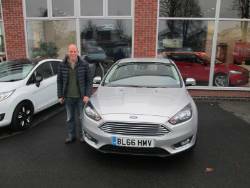 A very excited Mr Wilson taking delivery of his brand new Focus from Hodson Ford Penkridge. 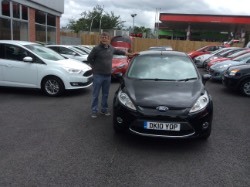 A very pleased Mr Richard Griffith picking up his brand new Ford Focus from Hodson Ford Penkridge. 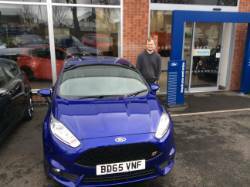 A very happy Mr Stuart Griffith taking delivery of his brand new Ford Focus from our salesman Mark Friendship at Hodson Ford. 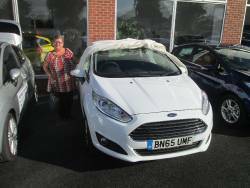 A very happy Mrs Calcroft picking up another car from Hodson from sales man Brian smith. 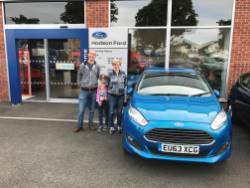 Mr Lee Beckett and his Daughter are very pleased to be taking delivery of their brand new Ford Fiesta from Mark Friendship at Hodsons. 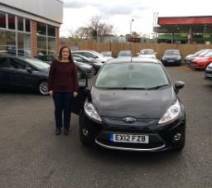 A very excited Miss Coles collecting her brand new Ford Fiesta Zetec from Mark Friendship at Hodson Ford Penkridge. 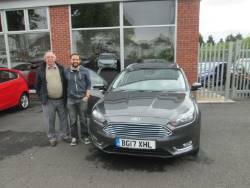 A very pleased Mr Vale-Onslow taking delivery of his brand new Ford Focus From Mark Friendship at Hodson Ford. 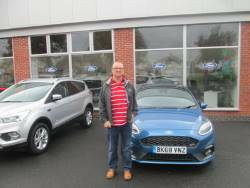 A very happy Mr Heys collecting his brand new Kuga from our salesman Mark Friendship here at Hodson Ford. 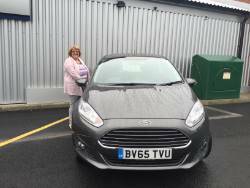 A very happy Mrs Williams collecting her brand new Ford Fiesta Zetec from our salesman Mark Friendship here at Hodson Ford. 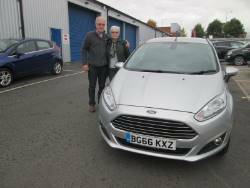 A very pleased Mr and Mrs Scrivens taking delivery of their new Fiesta from Hodson Ford. 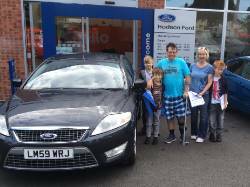 A very excited Woodfield Family, collecting their new Mondeo from our salesman Brian Smith here at Hodson Ford. 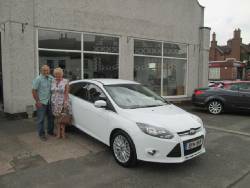 A very delighted Mr and Mrs Jeffs Collecting their new S-Max from our salesman Brian Smith, here at Hodson Ford. 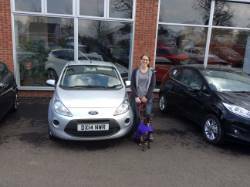 A very excited Miss Neuchterlien picking up her Ford KA from Hodson Ford. 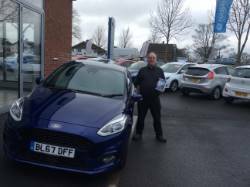 A very happy Mr Jackson taking delivery of his new Ford Focus from Hodson Ford. 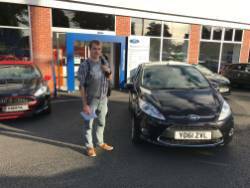 A very happy Mr Golby taking delivery of his brand new Ford Focus Zetec from our salesman Mark Friendship, here at Hodson Ford. 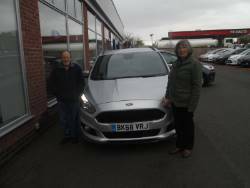 A very excited Mr and Mrs Hoye taking delivery of their new Ford Focus Zetec from our salesman Brian Smith at Hodson Ford. 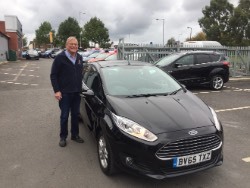 A very pleased Mr Fay collecting his new Ford Fiesta Zetec from our salesman Brian Smith at Hodson Ford. A special delivery for David Morton. 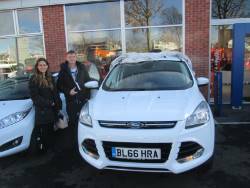 We hope you enjoy your new car. 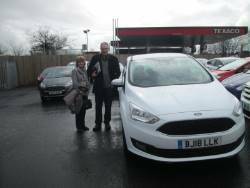 A very happy Mr Cooper collecting his brand new Ford Focus Titanium. 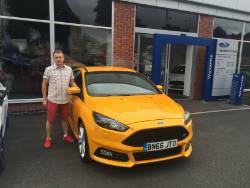 A very excited Mr Roberts colleting Ford Focus ST 3. 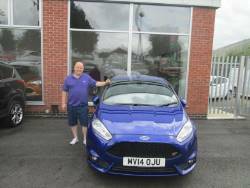 This is Mr Roberts second car from Hodson Ford. 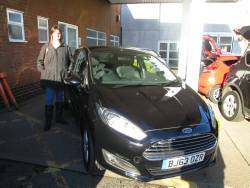 A very happy Miss Davenport and her partner collecting their new Ford Fiesta from Hodson Ford. 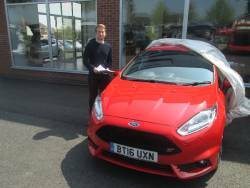 A very excited Mr Jack Davies taking delivery of his new Ford Fiesta Zetec S from Hodson Ford. 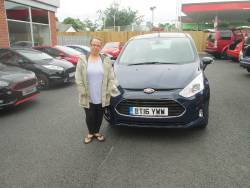 A very happy Miss Emily Powell also collecting her new Fiesta from our salesman Brian Smith at Hodson Ford. 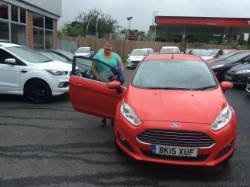 A very happy Mrs Powell collecting her new Ford Fiesta along side her daughter, from Hodson Ford. 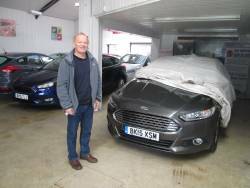 Mr May was more than pleased with his recent purchase from Hodson Ford. 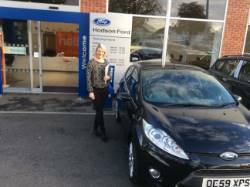 "I have had 13 cars purchased from Hodson Ford over the last 9 years and have always managed to get an excellent deal. 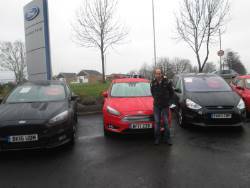 Mark Friendship is an exemplary Salesman!" 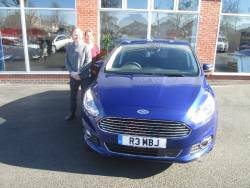 Miss Norton was very pleased with her purchase saying "Mark Friendship was friendly, helpful and explained the deal clearly". 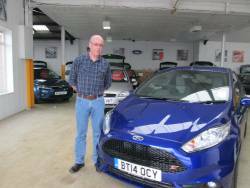 Mr Ludoski said "Mark Friendship is always a step ahead with anything I need when I change my car. He's excellent to deal with, top man!" 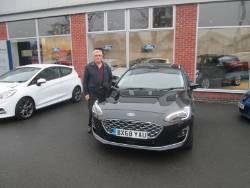 A very happy Mr John Page said "My whole sales experience was as always excellent as I have purchased all my new Ford cars at Hodson Ford over many many years. 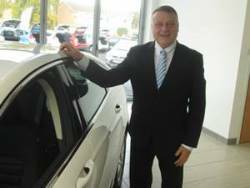 I would especially like to thank my sales person Mark Friendship, who always has a professional and dedicated attitude and nothing is too much trouble for him to assist you with. I can not think of one thing that could be improved, I am very happy with my sales experience. 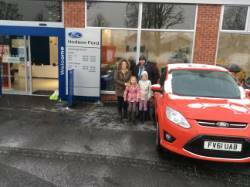 Thank you once again Hodson Ford!" 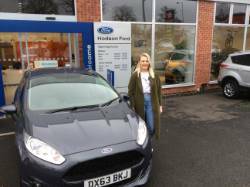 A very happy Miss Hodson picking up her very first car from Hodson Ford, ready for her to learn to drive in and hopefully pass her test very soon! 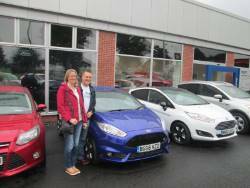 A very excited Mr and Mrs Davies picking up their new Fiesta ST from Brian at Hodsons. 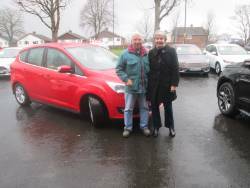 Mr and Mrs Miles taking delivery of their new C-Max from Hodson Ford after having their old car for 18 years! 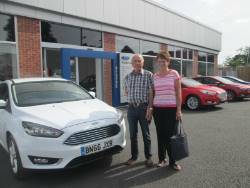 A very happy Mr and Mrs Moore collecting their new ford fusion from Brian Smith at Hodsons. 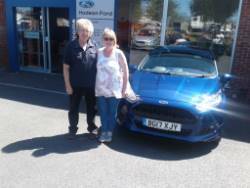 Mr and Mrs Harbourne said My wife Jane and I would like to thank Mark Friendship and the staff at Hodson Ford. 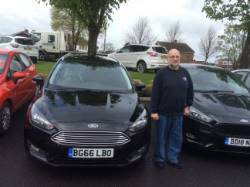 We picked up our two beautiful new 66 plate cars yesterday, the service we received was second to none, the cars are superb, we are delighted. Thank you all again and we will be back for new cars in the future. 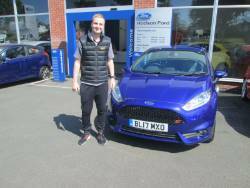 Mrs P Edmunds said Many thanks to Rob the sales manager at Hodson Ford who always delivers great customer service by going above and beyond and the car is brill!! 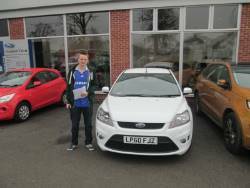 A very excited Jack Iredale collecting his brand new fiesta ST 3. 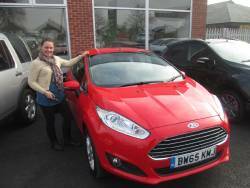 A very happy Miss Gough collecting her brand new Fiesta from Mark Friendship. 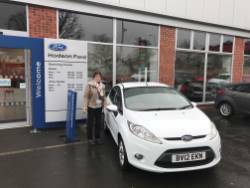 A very happy Mrs Elaine Warren collecting her second car from Hodsons. 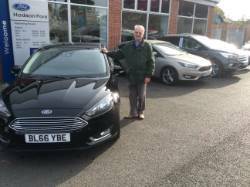 A very excited Mr. Payne collecting his new Ford Fusion. 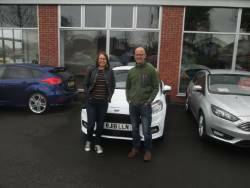 A very excited Mr. Sadler collecting his new Ford Focus Titanium X.
Mr Smart very happy with his new Fiesta St2. 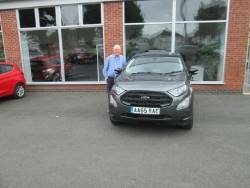 Mr Stephen Moffatt From Rugeley Who Purchased An EcoSport. A very smooth experience. Mark Friendship was excellent. 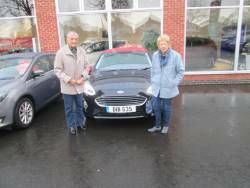 Mark Friendship, as always was very accommodating, found us the best deal and gave us service like none other. 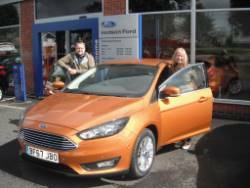 We have used other dealers and find Hodson Ford the best. 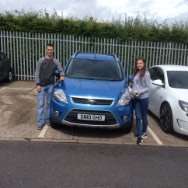 Both my son and daughter have also bought cars from Hodson Ford. 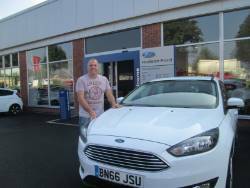 They must be the best Ford dealer in the UK. 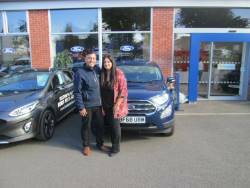 I was very impressed with the friendliness and efficiency of all staff. I was kept updated on progress of the repair. I would highly recommend you to others. Thank You so much for dealing with this so quickly. 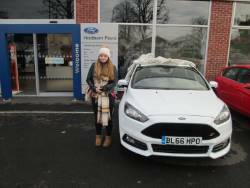 I really appreciate your help and I am extremely impressed by the service offered by Hodson Ford! Absolutely nothing could have improved, it was excellent. 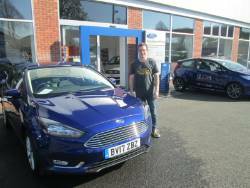 Mark was courteous and extremely helpful in every way. 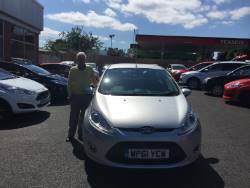 A great service from Mark Friendship in Sales. 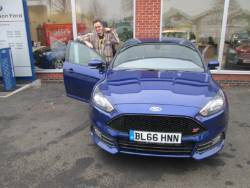 Things couldn't have gone smoother ordering the car to the spec i wanted. Just hope delivery goes as smooth. I did go to local garage but they could not match the price. Will update when i have the car. 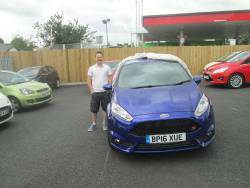 My car is a Spirit Blue ST2 with a few extras. Counting the days!! 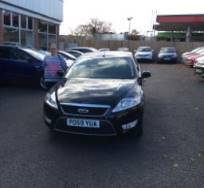 The ability to purchase a car at a good price without any hassle made choosing Carwow a very easy decision to make. 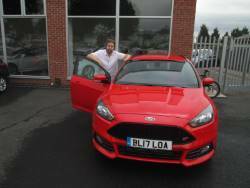 Having now taken delivery of my new car I can confirm that the whole process was very smooth and straightforward. 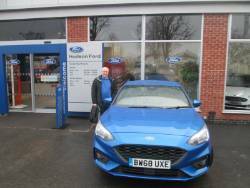 I received several well priced quotations for my chosen car and decided to go with Hodson Ford at Penkridge due to the large number of positive reviews. 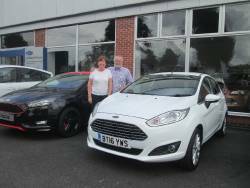 The service provided by Kerry Sargeant and Adrienne Haynes at Hodson Ford was extremely efficient and professional from start to finish. It is easy to see why there are so many 5 star reviews for this dealership. 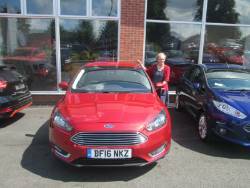 Adrienne and Particularly Kerry provided an excellent service - prompt, responsive and very helpful. I also got a deal that none of my local dealers were willing to Even come close to. I would defiantly recommend them to any prospective buyer. 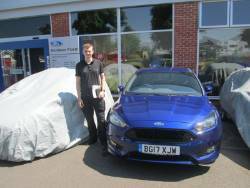 Hodson Ford were very helpful in the process of choosing my new focus. 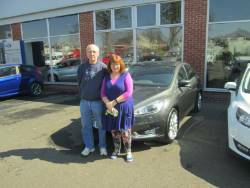 My wife and I were courteously greeted at the showroom and the salesman Dan was very knowledgeable about the car. 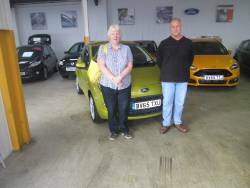 We were shown cars in various colours to help select the right colour for us and the financial details were properly explained. A good offer was made for my old car and the order process was quick and efficient. 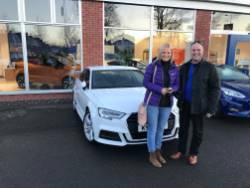 All of the earlier questions put to Adrienne and Kerry at Hodsons via Carwow were answered very quickly and positively. 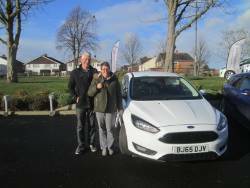 I would definitely recommend Carwow and Hodson to anyone wishing to buy a new Ford. 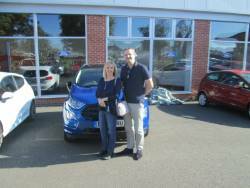 Collecting their New EcoSport from our Salesman Mark Friendship. 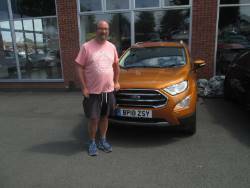 Purchased a new Ecosport from mark Friendship he was excellent and went out of his way to ensure he got me a good deal. 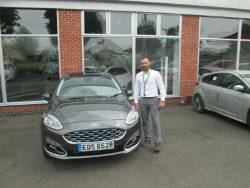 I purchased a new Focus from your Salesman Mark Friendship, he was very helpful and goes beyond his duty to satisfy the customer. 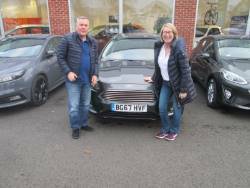 Very excited Collecting their New Fiesta Titanium X from our Salesman Mark Friendship, they have travelled all the way from Leicester and this will be their 4th Car from Mark. 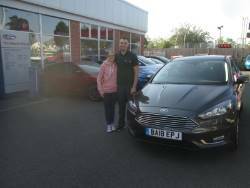 Mrs Baker collecting her brand new Ford Focus Zetec from our sales executive Dan Griffiths here at Hodson ford. 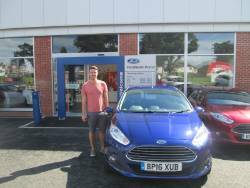 Another happy customer at Hodson Ford. 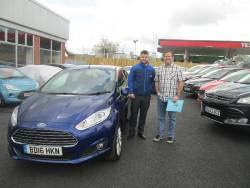 Collecting his new Fiesta from Sales Executive Dale Potter. 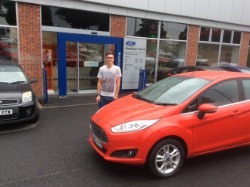 Dean Jackson collecting his new car today Hodson Ford!! 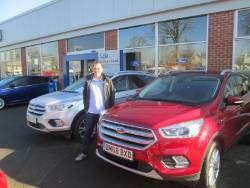 who purchased a Kuga from our Salesman Mark Friendship. 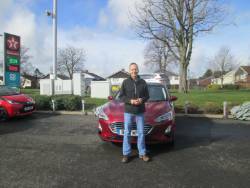 Mark is so helpful and friendly I always have such an amazing experience. Always a pleasure speaking to Mark, he is Fab! Thanks for everything. 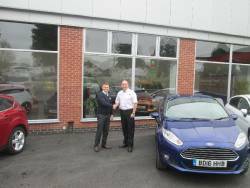 Purchased a New Fiesta from our Salesman Mark friendship. Very Helpful and nice Sales staff easy to understand everything. 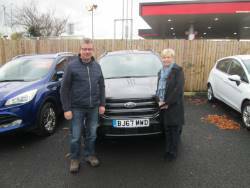 I actually purchased my new car through the Car Wow website; Hodson Ford were the dealership that impressed me most out of the 5 choices I was given. 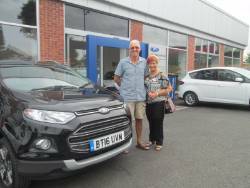 They were quick to respond to any questions I had, and the whole experience from start to finish ran very smoothly. I don't have a single negative comment to make. 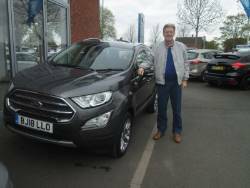 I purchased a new Ecosport from Mark Friendship. The Sales team were very helpful and attentive. 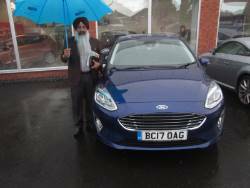 I purchased a new Fiesta from Mark Friendship he has a friendly helpful attitude to buying a car. 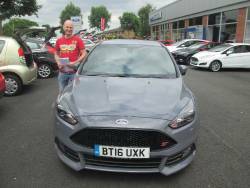 I purchased a New Focus from Mark Friendship. Hassle free negotiations without the constant pressure of a Sales Person,Nothing to improve. 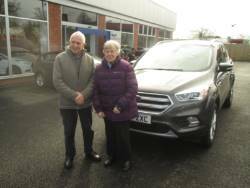 Just a quick note to let you know my Aunty is over the moon with her new car and to thank you once again for looking after us so well. I am sure we will do further business in the near future. 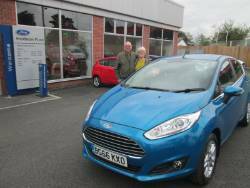 Mr Harry was delighted with his brand new Fiesta 1.0 Ecoboost Powershift. 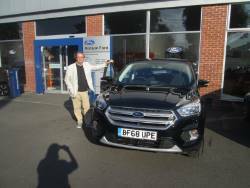 Excellent experience dealing with Mark Friendship. 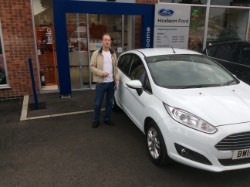 I could not fault any aspect of my dealings with Hodson Ford. 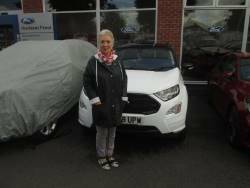 A very happy Tina Barrett collecting her new Ford Eco sport from Hodson ford. 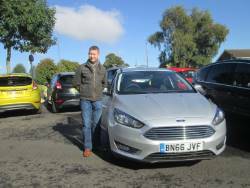 I was delighted with the quote via Carwow. 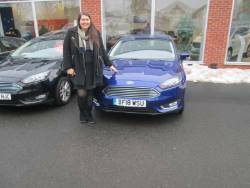 The experience with Adrienne and the other staff I dealt with at Hodson Ford was both friendly and professional and I would have no hesitation in recommending them. 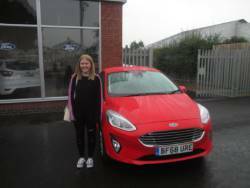 I dealt with Kerry and she has been excellent from the initial enquiry stage to the final ordering process. She has responded quickly to all of my messages (Lots!) and answered all queried without any hassle whatsoever. Very professional via message centre on Carwow and via telephone. A credit to her dealership. 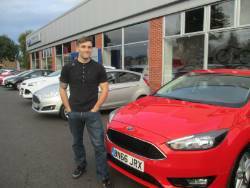 Hodson Ford offered me a very competitive package and were a pleasure to deal with. My contacts there Adrienne and Kerry handled all my queries via email and on the phone quickly and managed to find me an already part built car at the factory which matched the specification of the car I wanted with my second choice of colour, this enabled me to take delivery 8 weeks before a total custom specification car would arrive. Pick up of car was smooth and efficient. Very pleasant to deal with, Thank You! 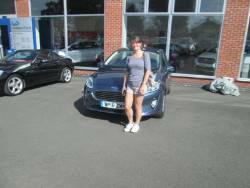 Adrienne was great very helpful and made the whole process run smoothly. We asked ... How can we improve our service to our customer? "We have been most impressed by the 'can do' attitude. Sharon (in the office) was most helpful and a pleasure to have as our contact. 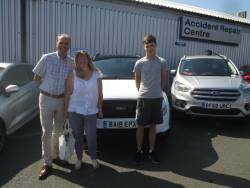 General Comments; Thank you very much, it was very helpful for the car to be repaired whist we were on holiday and then delivered back to us on our return. Very good service highly recommended! 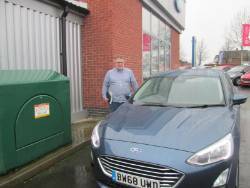 Very efficient, agreed times for collection and return of my vehicle, Spot on! We asked how can we improve our service to our customers? "Don't think you can improve! 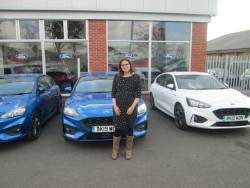 Everyone has been polite, well mannered on the telephone and when collecting and returning my vehicle to me"
General Comments; Could not fault the Service from Hodson Ford, they were informative and very professional. "Unsure.. Every person I spoke to was a pleasure to deal with. 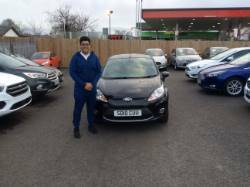 Great service and very professional staff"
General Comments; The person that picked up my vehicle was really professional, friendly and made me feel well looked after. 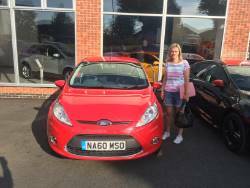 Sharon who dealt with my Insurance Excess was really genuine and friendly to deal with. Great work on the vehicle too!! Very friendly from the outset with the most competitive quote it was a no brainer. 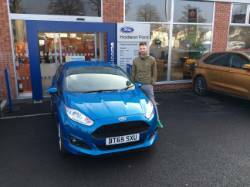 They have always responded to questions/queries promptly and Hodson Ford have just been a pleasure to deal with .. Cant wait for my New Car to arrive now!! 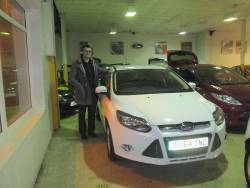 Mark was excellent, very efficient with dealing with the paper side of things. Always kept me informed on what was happening with my new car. Mark Friendship took the time to talk over everything at great length. 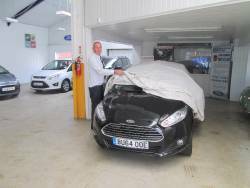 The Dealership has recently moved to a bigger premises, however the staff still maintain its personal and friendly approach. First time buying a new car although i have not picked it up yet, the process so far has been easy. 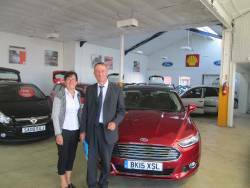 The team at Hodson Ford have been friendly and efficient throughout answering all my questions in a timely manner. 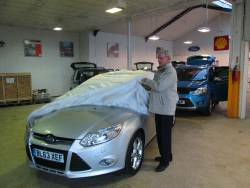 I would not hesitate to recommend this Dealer as they offer competitive prices and a professional service. 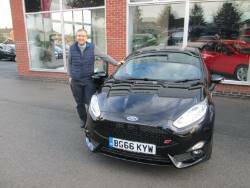 Excellent Sales Service by Mark Friendship he made the whole buying a new car experience from start to finish and beyond exceptional. 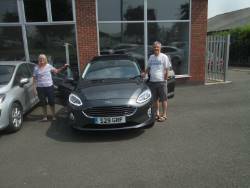 Had a very good experience did not feel at all pressured, Mark was very kind and explained things to us clearly but did state that should we have any worries to feel free to contact him. 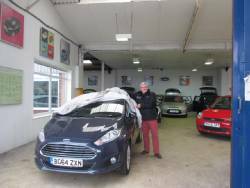 Everything was ready on our arrival and Mark Friendship has excellent customer service. Great place to purchase from. 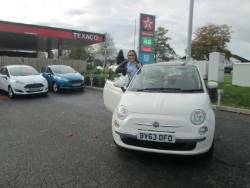 A really good experience using Car Wow. 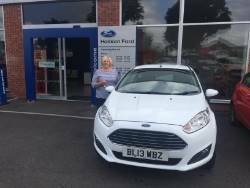 Kerry at Hodson Ford in Penkridge is wonderful as shes so helpful, friendly and knowledgeable. Kerry listened to what i wanted whereas other dealers have just tried to push things on me that i dont want. I would definitely use this service and this Dealer again. 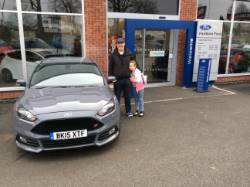 A great service from Hodson Ford throughout. 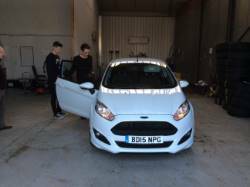 The whole process was so simple and faultless; getting the exact vehicle and specification you want without any pushy sales fro unwanted extras. 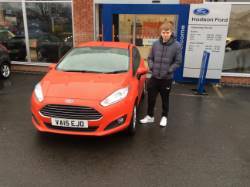 I would defiantly buy from Hodson Ford again. Special Mention to Kerry and Adrienne for all their help - many Thanks! 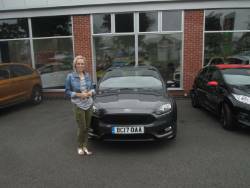 Mrs Collins collecting her brand new Ford Fiesta 1.0L Ecoboost 100ps Black Edition, from our Sales Executive Dale Potter. 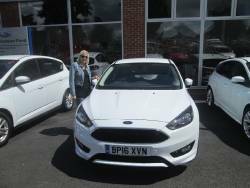 Mrs Rebecca Ives collecting her new Ford Focus, from Hodson Ford. 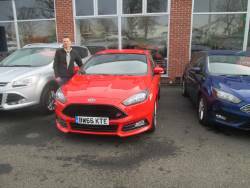 Mr Kevin lee comments on his New car purchase. Everything went perfectly well from the first to the last minute. I think the whole deal was completed within 45 mins. 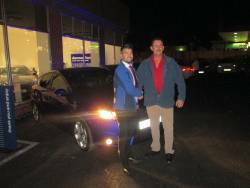 I discussed the deal with the same salesman I had used for the two previous purchases. He was very understanding of my requirements and we completed a deal second to none. 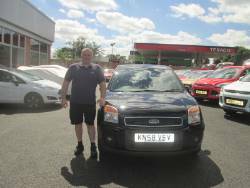 Very approachable and an outstanding salesman. The salesman was Rob Caron. 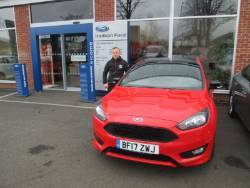 Undoubtedly Hodson Ford are the best dealership in Staffordshire and I have no doubts in recommending them to everyone I speak to. 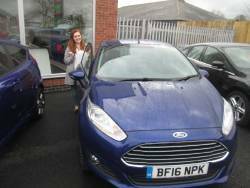 Ordered my car today, both Kerry and Adrienne were very patient with this very indecisive customer. A lot of time was spent exchanging emails before I finally took advantage of their offers. 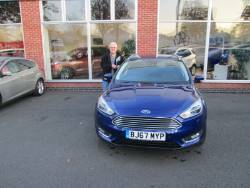 I can certainly recommend Hodson Ford Penkridge. They were brilliant in every respect. 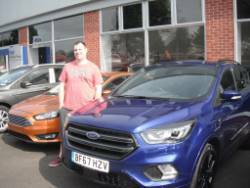 I have been to several car dealers recently, and the experiences with them, have made me realise just how good Hodson Ford are. I haven't taken delivery of the car yet, but I am certain that there will be no problems. Good communication throughout with no pressure tactics before sale was confirmed. Simple, straightforward process. Shame you can't walk into any dealer and enjoy this kind of honesty. It's the future. 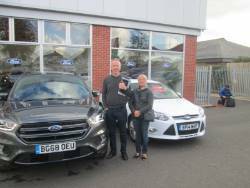 I was very impressed with both Hodson Ford and CarWow. 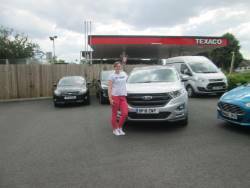 Kerry was professional and friendly, explained the various options and ordering process clearly and responded quickly to any questions I had. 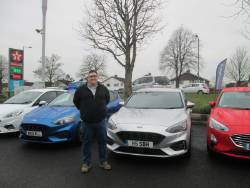 On top of that they offered the best discount of all the Ford dealers. 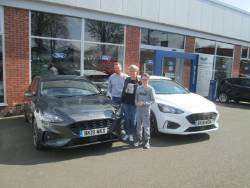 I would definitely recommend Hodsons of Penkridge, over the past few weeks I have been to some of the larger dealerships in the area and have found them rude, off hand and they showed no interest in what I actually required from a new car. 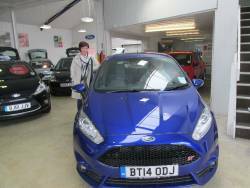 I could fault the team at Hodsons from the moment I went into the showroom they made me feel like my purchase was important. 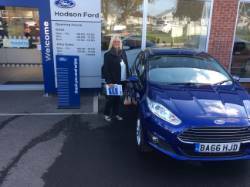 Hodson ford gave me the best quote, and gave me a fair part exchange on my car, Adrienne was very friendly and helpful and would recommend. Would recommend without hesitation. 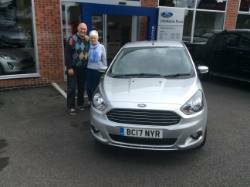 The team listened to me, remembered I work in the community and made me aware of a sat nav deal that I could not say no to. Clear non jargon quote. Up front, no hassling, no dealing What a relief! 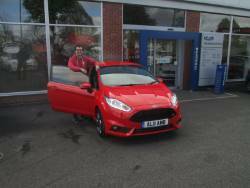 I had a 370 mile round trip to collect my car from Hodson Ford, but it was worth every mile. Very friendly from the start. Welcoming. No pressure. Listened to what we wanted to buy rather then trying to sell what they wanted. Test drive there and then. Given time to go away and think. Answered all questions we asked. Overall excellent experience. 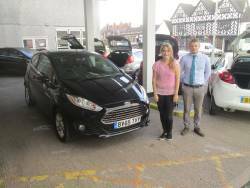 A local dealer Hodson Ford with a fantastic sales team, straight forward and enjoyable process. 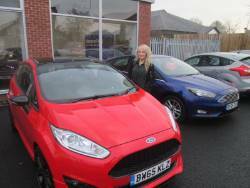 I can't fault my experience dealing with Kerry Sargent at Hodson Ford Penkridge. 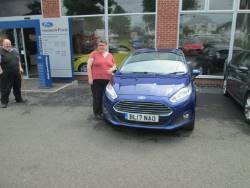 The service she provided was brilliant, and was able to answer all my questions regarding my order. Their offer for me was the best around, and I feel very happy with my choice to go with him. 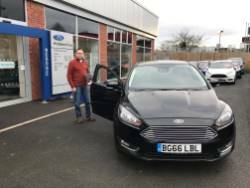 I would recommend this garage to anyone looking for a new Ford. Everyone is always so helpful and the new premises are a fantastic improvement. Good explanation of the sales process. Smart new dealership site, good parking with easy access. A very pleasing environment to conduct business. I have no suggestions to improve the service I received, Keep up the good work Mark and Team. 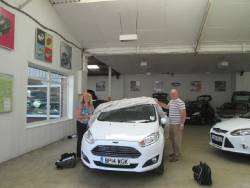 The staff were very helpful and made us feel very welcome. The Salesman Mark went through everything with us and answered all our questions in plain English. Not sure anything could have been improved. I got what I asked for and more from Mark and the dealership when purchasing my new vehicle. 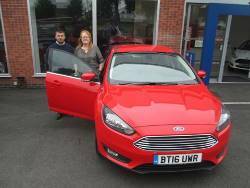 Excellent customer care From Your Salesman Mark. Detailed information every step of the process. I am unable to give a viewpoint on improvement as the quality of service I received was perfect. I will certainly be visiting this branch when I renew my vehicle in the future. 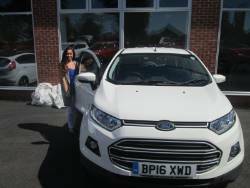 I had made enquiries through Carwow re. 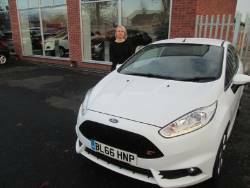 a number of car models and specs and Adrienne had been the person who consistently sent competitive quotes. 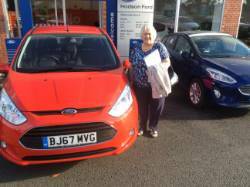 When I had decided on the car I wanted, again her quote was the most competitive. 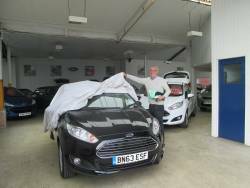 Once the sale was confirmed, the paperwork process was very straightforward, with most being done by email before we collected the car. 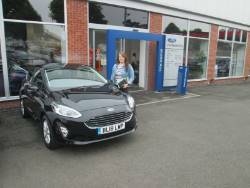 The staff at the dealership were friendly and welcoming and answered all questions. Collection was also straightforward. 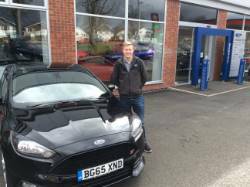 A simple, cost effective way of buying a car. 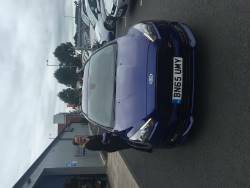 I would recommend Carwow and HFP. 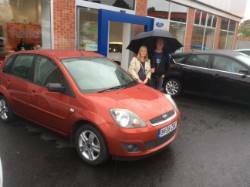 Adrienne and Kerry explained the lease purchase in a straight forward, easy to understand manner, highlighting information they believed was for my benefit without being pushy in the slightest. They were both patient and helpful with any queries I had. 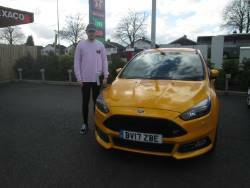 They kept me fully up-to-date with the progress of my order and made my 370 mile round trip to collect my car worth the journey. 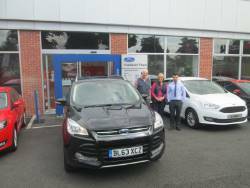 It was a real pleasure to do business with Hodson Ford and will not hesitate to recommend them to anyone. Thank you ladies! 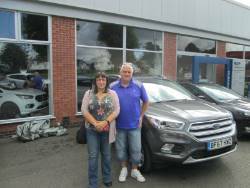 The Dealer hodson Ford was excellent in all areas, from arranging a really good deal to the delivery of the vehicle. 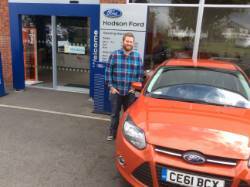 Impressed with whole buying experience, particularly pleased with the attention I got from the salesman (Dan)of Hodson Ford. 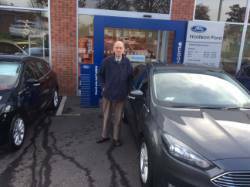 David Grove said Brian smith of Hodson Ford listened to my requirements and acted on them with utmost professionalism. 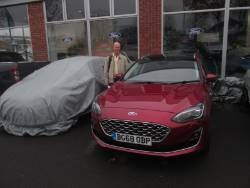 This was the best and easiest car purchase I have experienced, having had Ford for the last 25years. 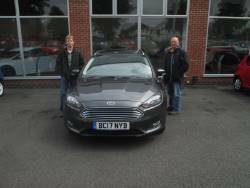 Brian gave me a hassle free transaction with no pressure selling and excellent advice. 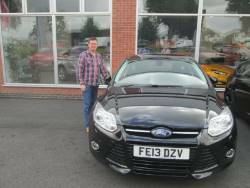 An excellent service from Mark Friendship. 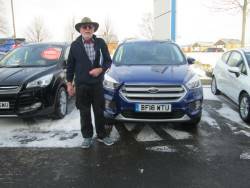 Salesman Mark Friendship kept me well informed at every stage of the purchase. 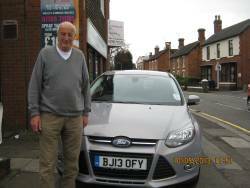 Mr Mark Friendship is as always a very helpful person regarding my motoring needs. 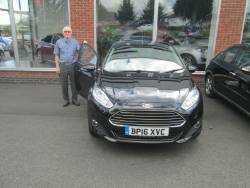 A true gent and excellent salesperson. Always goes the extra mile. I always get a professional job done by my salesman Mark Friendship. 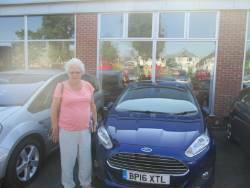 Collecting their new Ka, it is Mrs Prince's first ever new vehicle she is delighted and we are delighted for her. 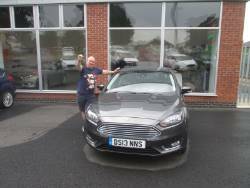 Buying my car from Hodson Ford was stress free purchase found salesman Mark Friendship extremley helpful and willing to do the deal that i was looking for many thanks Mark. 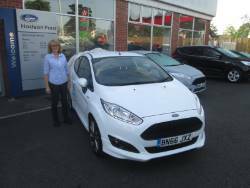 Adrienne from Hodson Ford was friendly, helpful and professional. 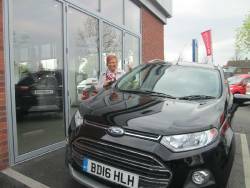 She quicky agreed the details of the very good deal that I had been offered through carwow, over a cup of coffee. 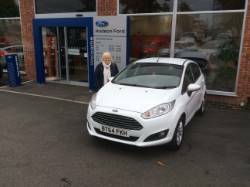 I would certainly recommend both her and Hodson Ford. Five star for me ! 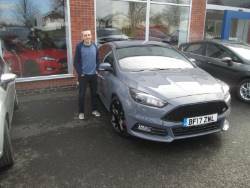 I used Hodsons Ford to order a Focus ST - despite seeing that others were being quoted build and delivery schedules of 12+ weeks by other dealers, I ordered mine and drove it away within 8 weeks from a factory build. Both Kerry and Adrienne were quick to respond to queries and the many questions i had during the order process and with updates during the build and delivery process. Collection on the day was nice and simple and couldn't be happier with car, will certainly be considering them again when it comes to renewing in years to come! 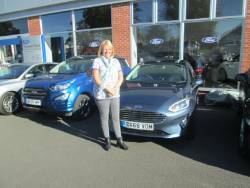 Very friendly, efficient and straightforward service, Adrienne and Kerry came back very quickly on all information requests, Adrienne was very good at the showroom on car hand over and the family run business seemed very genuine and happy to help. 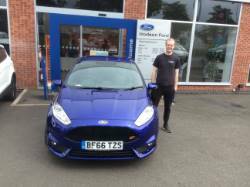 Got a good deal on a Fiesta ST3 Mountune, and they worked hard to sort the Mountune Kit issue, which was nothing to do with their service. Highly recommended for a no nonsense, quick and efficient service. Even received the vehicle 2 weeks earlier than anticipated. 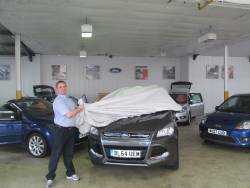 From the moment i contacted Hodson Ford the process has been stress free. 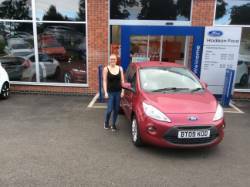 Adrienne at Hodson Ford went out of her way to make sure everything was spot on. She was very quick at answering questions and kept me updated regularly. By far the best car buying experience I have ever had. 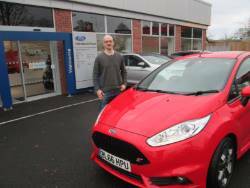 Nick takes delivery of his New Fiesta ST which he bought from steve at Hodson ford using his Carwow offer. 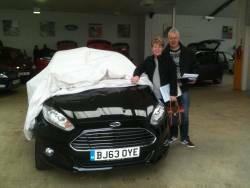 A big thank you to Adrienne and Kerry for being so patient and for making the process so easy. I found the whole experience to be very friendly with no pressure at all, yet professional all the way through. The car was a factory build, so took a few weeks to arrive but that suited our timetable well. 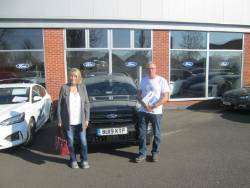 The paperwork was completed very quickly, leaving us time to have a look around Penkridge afterwards, and to visit to the pie shop across the road for lunch. 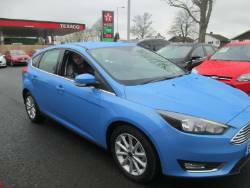 It was well worth the easy train ride from Northampton to collect the new Focus, which is absolutely first class. The journey back to home was good and the car drove perfectly. 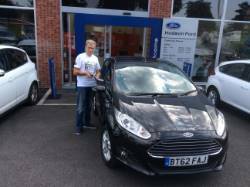 Five stars all round, and I would recommend Hodson Ford to anyone. Thank you again. 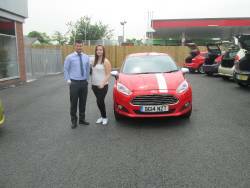 The team at Hodson Ford were very helpful and buying a car from them was a real pleasure. 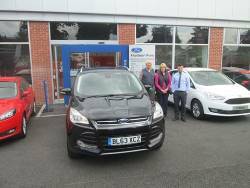 The sales process is very efficient, yet the team were happy to spend time and answer all the questions we had. 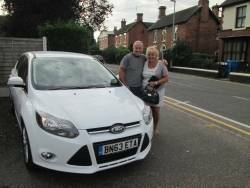 Really pleased that we were able to trade in our old car and for a very good price. Well done Adrienne and the team!! The ladies from Hodson were great. 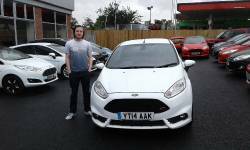 We had a lot of communicating back and fore, they were very patient with us, until we decided on the spec for our car. Now the deal is done we just have to await delivery! 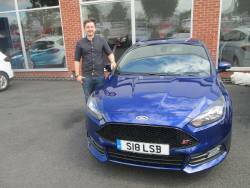 Fantastic experience buying from here, great knowledge of car and options available, very timely replays to all questions, (I had a few!). At the end of the day, a massive saving on new price. 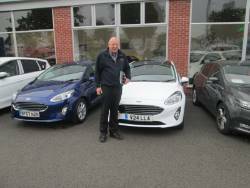 Well pleased and highly recommended dealer, Kerry Sargeant is the one to ask for in particular. 10 out of 10 in all aspects. 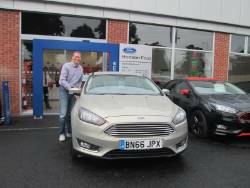 Mr Barry Broad collecting his brand new Mondeo. 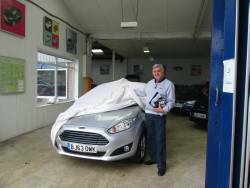 A loyal servant to the Ford brand and indeed Hodson Ford. 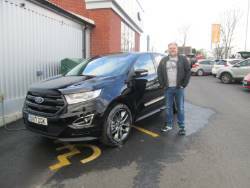 Tony takes delivery from Rob Caron @ Hodson Ford of his New Kuga .He came from South Wales as a recomendation as Steve sells lots of vehicles to Ford employees at the Bridgend engine plant. 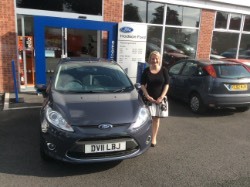 Hodson Ford were excellent from first contact right through to me driving away!! 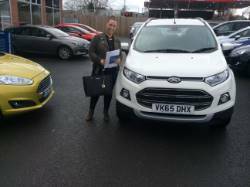 Mark Friendship my sales person was professional and very welcoming from the offset of the process. 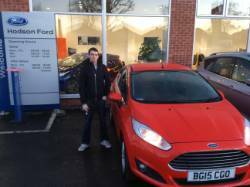 Hodson Ford were very very good and i would not hesitate in using them again and recommending them to others. 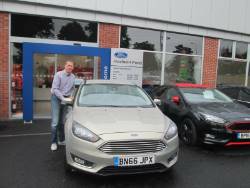 All in i was extremley happy with the service granted to me by Mark and Hodson Ford. Mark Friendship quickly built up a very good rapport with myself. 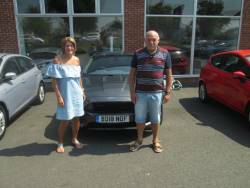 He was very helpful and kept me informed of the progress of my purchase, from where it was in the build phase to arranging a convient collection date and time.The vehicle itself is everything i had expected. Mark is very professional, and very friendly. We were made to feel welcome and that we were valued as a customer. 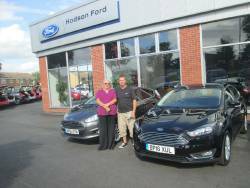 I have already recommended Hodson Ford to my Family and Friends. 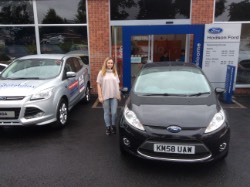 My 2 Daughters will be buying their new Ford from Hodsons. Thankyou for making the whole experience very pleasant and enjoyable. Mark Friendship was excellent. I dont live local to this dealership, but i used it because it was highly recommended and based on my own previous experience. 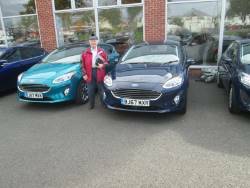 Mark Friendship went out of his way in trying to make sure i was completely satisfied and kept me up to date by phone at every stage. 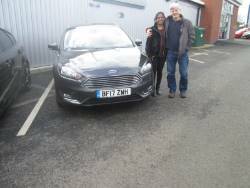 I travelled from Birmingham so Mark always made sure that everything was ready for me when i arrived and also that i didnt have to make any unnecessary journeys. 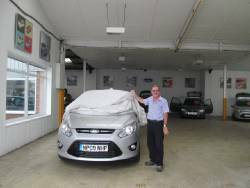 We have been dealing with Mark Friendship for the last 10 years changing our vehicles yearly. We find Mark so easy to to get on with and his knowledge is second to none. We would also like to mention Rob the manager who is also very approachable. 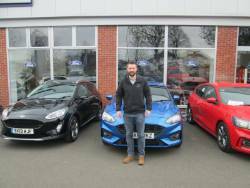 We would never use any of the big dealerships in or around Birmingham and a few of them should take a few tips from Hodson Ford on how to deal with customers. 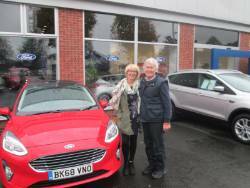 The Salesperson Mark Friendship was very kind and helpful. The best quotation i could find. 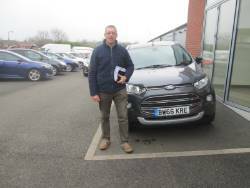 Our Salesman Mark Friendsship was very helpful and informative throughout the sale. 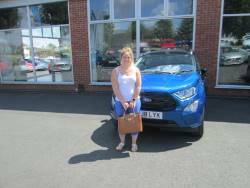 Chose Hodson Ford as they replied promptly to my emails and dealt with my phone calls promptly also. 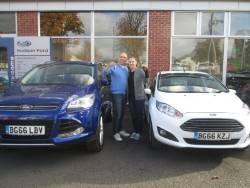 They were the cheapest dealer and the most professional i have dealt with , Kerry was amazing and Adrienne also . 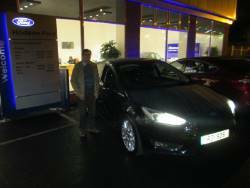 It has been a real eye opener using carwow to buy a new car. 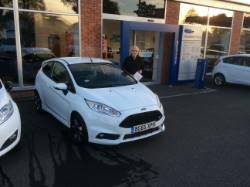 Not only did I get a fantastic price (which I've no doubt I'd never be able to haggle my local dealer down to) but also a great service. 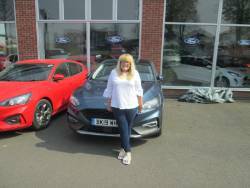 I received the offer from Hodson Ford very quickly and both Adrienne and Kerry have been very helpful and are always very quick to respond to queries in a straightforward manner, without ever being pushy. 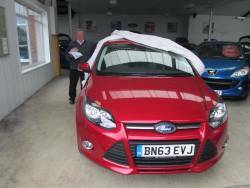 They also managed to cut the proposed delivery time I'd had from my local dealer in half which I was very happy with. 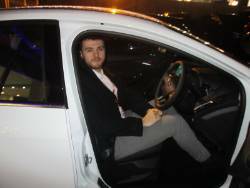 I have not yet taken delivery of my car but I am sure the rest of the process will be as smooth and hassle-free as it has been so far. 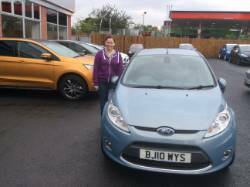 I have a close family member planning to buy a new car soon and I will have no qualms recommending they use carwow and Hodson Ford. 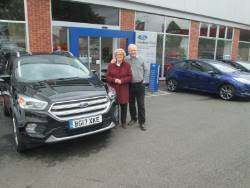 We had looked at The Kuga last July and had decided it was the best compared with Honda and BMW, as ever my wife could not decide, as it happens due to an over the limit driver coming through lights on red and went head-on into our Honda Civic, just bruises and air bag burns so could have been a lot worse, it was a write-off. I did not want to spend time and effort doing the showroom bit again where there is never anyone that can make a decision and the coffee is rubbish so being in the computer industry decided to give CarWow a try. 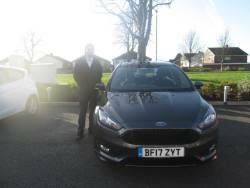 The process was 10 days from initial contact to car pickup which was yesterday, very impressed with the service did everything by email and did not drive the 45 miles by road to the dealership till pick-up. 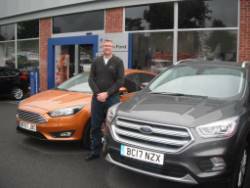 I recommend both Hodson Ford and Carwow to anyone who knows what they want. 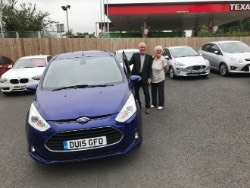 This is the way Car Buying should be, no hard sell, no standing around in showrooms being hung onto for hours and best of all the Price was Right, Many Thanks to all. Can't say enough good things about these guys. Dealt with Kerry, who has been absolutely brilliant. Friendly, knowledgable, professional and never pushy. A complete contrast to the experience I received at my local dealership. Kerry was always quick to respond and answered all my questions regardless of how many times I asked them! I have only placed the order at this stage - so fingers crossed the rest of my journey is as straight forward as it has been. CarWow as a website has been an eye opener, so I'll definitely be using it in future. You can burn away whole weekends sitting in showrooms while dealers run backwards and forwards to the person who can actually make decisions. This way, I can let them approach me, fire off a message and get back to whatever I was doing. Adrienne was extremely helpful. She was very professional and not at all pushy in closing the sale, making sure I had the information and answers requested. I placed my order over the phone, saving the 25 mile trip to the garage. I have no hesitation in recommending her. 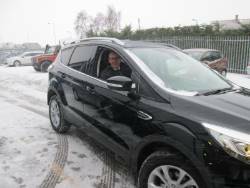 Looking forward to receiving my Ford Kuga in March. A really simple process run well by the very efficient and helpful Adrienne. 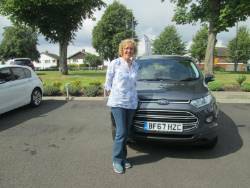 I was really surprised by the discount offered on the car I was interested in, a Ford BMax, and the deal was sealed for me after a test drive and a very reasonable valuation on the car I was trading in. Would highly recommend! 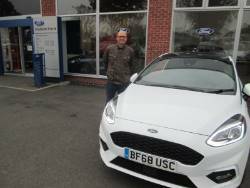 Michael takes delivery of a New Shape Focus with the new 1.5 ecoboost engine from Rob Caron .He has had several cars from Hodsons over the years . 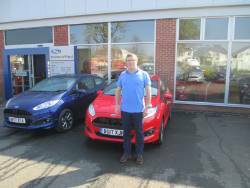 Mr Jones recently purchased a New Fiesta from our salesman Mark Friendship, i a recent Ford questionaire he said "There is nothing the dealership could of done better! Mark Friendship was excellent the whole way through the process and i felt very happy the whole way through! He is a credit to Ford and i will defiantlyy be staying with Ford for a while!" 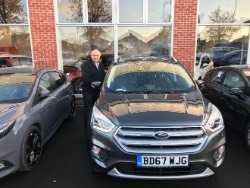 Mr Bond recently purchased a New Kuga from our salesman Mark Friendship and this is what he said to Ford on a recent questionaire "Mark Friendship spent time with us to explain the various details of the car. We were offered coffee and made to feel comfortable rather than being rushed or presssured. 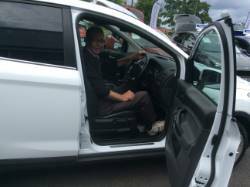 We were offered, and took up his offer to test drive which did not disappoint. 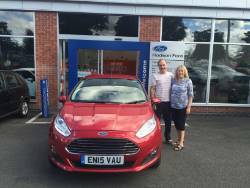 This was an enjoyable experience and one we hope to repeat in the future"
Mark Friendship made my wife and myself feel very comfortable and at ease when purchasing our New Ford Fiesta. 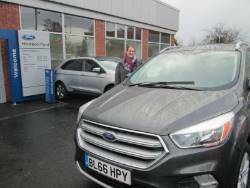 Hazel takes delivery of her New Titanium X from Brian at Hodson Ford ,this is what she said on a recent survey "So easy to purchase a car from carwow. 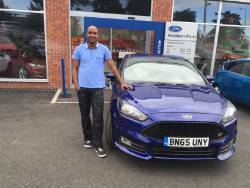 No hustle just one beautiful car with the help of Brian Smith. Received 5 star treatment. Will make time to visit Jaspers next time"Jaspers is an amazing bakers in the village . 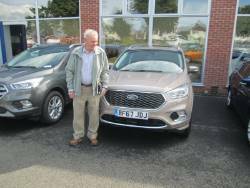 Denis bought his new car from Rob Caron and this is what he said to Ford on a recent questioaire "I could not have been happier with the experience, Hodson Ford are a wonderful company. 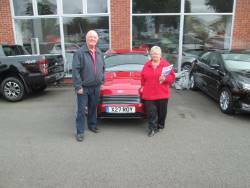 They offer a level of personal service that is second to none." 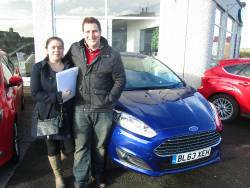 Mark was the sales contact. Very helpful and quick to repond by phone or email. Mark actually came in on a Sunday (his day off) to complete the handover for my covenience. This was much appreciated. cannot fault it . 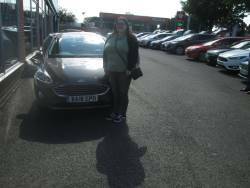 got the car i wanted at the price i was happy with from Adrienne at Hodson Ford. 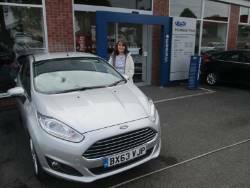 A big thank you to Adrienne at Hodson Ford. The process was professional and efficient. My new car came 2 weeks earlier than planned and the price quoted was the price I paid. 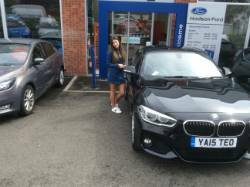 Would definitely recommend the CarWow experience to friends and family. Adrienne made the process pleasant and easy from start to finish. Not at all the experience I have previously seen with other car dealers. 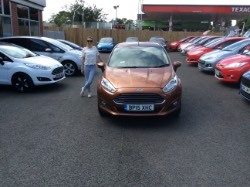 We had nearly purchased from another ( much larger ) Ford dealership where I saw the other side of the car sales business ( Pushy and making you feel a little uneasy, treating you as if they are a bit smarter than you etc I'm sure you have met them ! ). Glad we didn't give them our business and in fact we dropped them when they did not return our telephone calls or forward by email our request for information. They obviously did not need the business ! Otherwise we would have probably gone through with the sale out of a bit of a misguided sense of obligation. 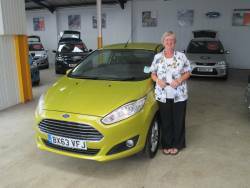 Adrianne was a very nice, honest lady with a no pressure sales manner who made us feel at ease. 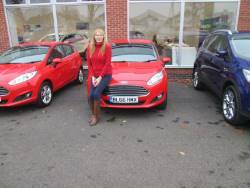 We would thoroughly recommend Adrienne to anyone. Thanks for your help. • "You Can not improve on perfection". 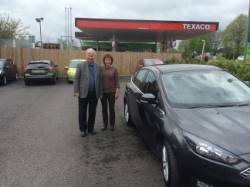 • "Five star treatment from reception/driving and mechanical staff." 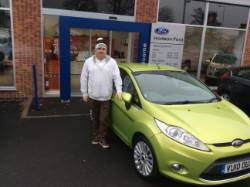 Andy collects his new car from Brian at Hodsons having been recomended by one of Brian's customers. 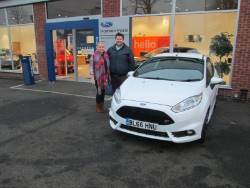 A very excited Erica unveils her new Fiesta ST2 ,which she orderd from Mark at Hodsons Ford using the carwow website . 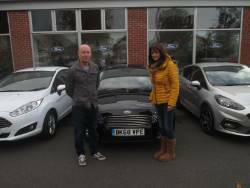 Miss Sarah Knights collecting her New Ford Fiesta from our Salesman Mark Friendship. 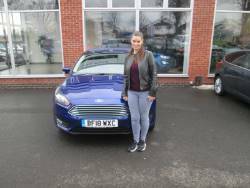 Miss Knights travelled up to us from Middlesex after being recommended to us from a close relative who has also dealt with Mark. 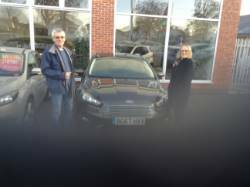 I purchased a Focus from Mark Friendship i felt completely relaxed and not pressurised at all in any way, I was very pleased with the service as always. 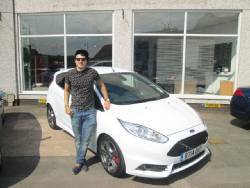 This was my first experience using an internet company to buy a new car, it was brilliant. 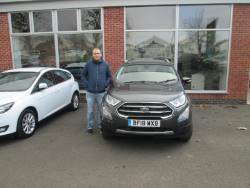 Carwow found a number of main distributers to quote me on a new Kuga, I settled on a deal with Hodson Ford and found the salesman Mark very helpful and courteous. 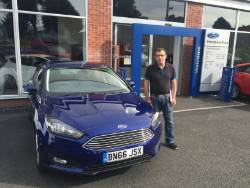 I would have no hesitation recommending using Carwow or Hodson Ford to anyone. The salesman Mark could not have been more helpful. He sourced the car I was looking for and then gave me a very good deal. 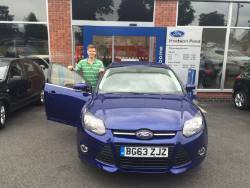 My experience of dealing with Hodson Ford was much better than I got trying to deal with my local Ford dealership. 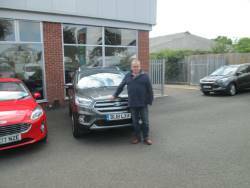 I will definitely go back to Hodson's for my next new Ford. 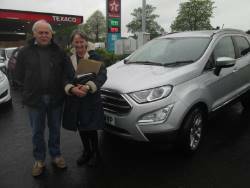 A very excited Gaynor takes delivery of the 1st Ecosport from Rob Caron at Hodson Ford . We would like to thank you for the customer service you have given to us over the last month or so. 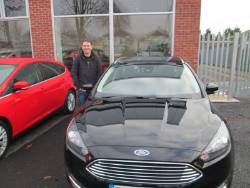 We purchased a used Ford Mondeo from you and dealt with Mark who was friendly, helpful but not pushy. 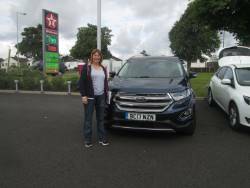 We were forced into replacing our previous car because it broke down when we were nearly home from a holiday while towing our caravan. 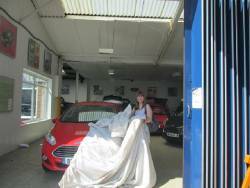 The cost to repair the car was not worth it so we were anxious about buying another car. 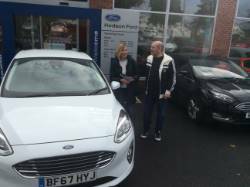 The car was running fine until about two weeks ago, so when it broke down we were distraught.To cut a long story short, i phoned Hodson's and spoke to and subsequently dealt with Claire Jones. 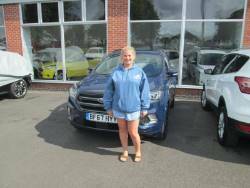 Claire was very helpful and organised collection, the repair and delivery of the car back to us evan though we live in Coventry. 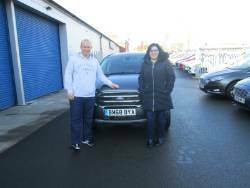 We towed the caravan for the first time last weekend and although we were nervous the car ran smoothly.I wish we were nearer to you as we would of considered the service package offered to us. 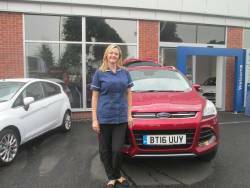 So we would like to say Thank You to Claire and all the staff at Hodson's. 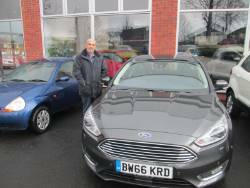 The overall experience in leasing a new fiesta was fantastic, Mark Friendship was so helpful and was available to chat at any time if i had questions. His understanding that i was a first time buyer so to speak was exceptional. I can not thank him enough. 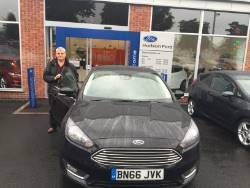 The dealer at Hodson Ford was excellent. He was very personable. He understood our needs exactly and did whatever he could to meet them. 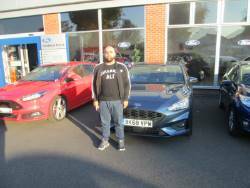 He also offered us all of the relevant additional products for the car and a very comprehensive service plan, explaining carefully the benefits of each one. 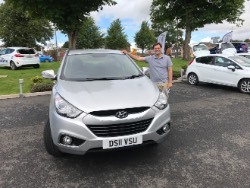 If I had any questions following our purchase, he was available for contact via email which was very helpful to me as this is the first car I have ever bought. 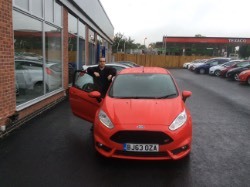 Like a lot of other reviewers I started out at my "local" Ford dealer and was somewhat underwhelmed with their big dealer approach to my part exchange as part of buying a new Fiesta 1.25 Zetec. 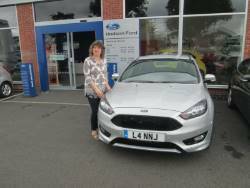 On discovering Carwow I was pleased how quickly offers arrived and suprised at the potential savings, Adrienne at Hodson Ford in Penkridge were very professional and great to deal with, Cannot reccomend Hodson Ford enough! 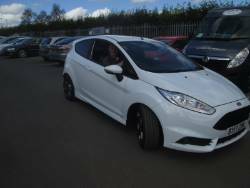 I bought a Fiesta. Hodsons are very competitive. 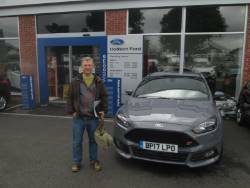 Excellent service from Steve Haley at Hodson Ford. Highly recommended. Very professional. I would use them again! 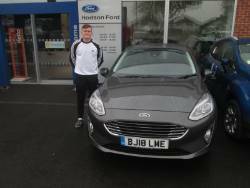 I would recommend anyone to use Hodson Ford for the purchase of a new car. They were helpful and explained everything in great detail. 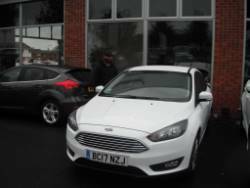 Mark Friendship is a great salesman would defiantly recommend him to anyone. 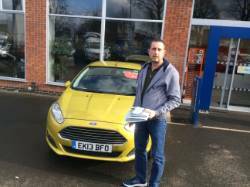 It seemed he wasnt just after a quick sale, he seemed like he genuinely cared about the sale. 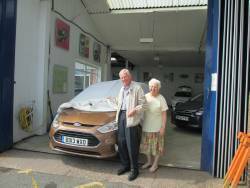 He is a credit to the dealership and will be defiantly using his services again. 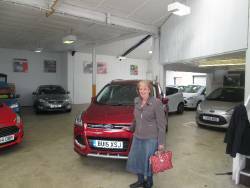 Adrienne was one of the most professional people I have ever dealt with when buying a car. No haggling the price quoted was the price we paid. No sitting with a salesman who kept playing with figures and going to see the manager. 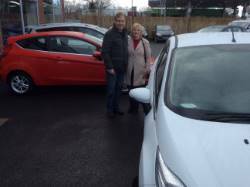 Saved nearly £2000 over local dealer so well worth 100 mile trip. 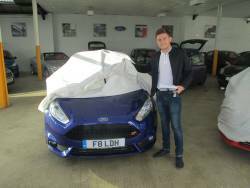 Would recommend Hodson Ford to anyone. I dealt solely with Adrienne Haynes who made the process very fast and straight forward. 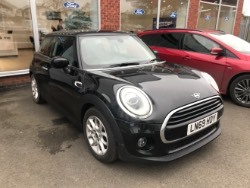 I have never bought a car this way before but if delivery goes as planned I will definitely be recommending this dealership as it has saved me a lot of time and more importantly ... MONEY! My vehicle was involved in a accident and had to come down to your Bodyshop for some repairs,I found your staff to be very friendly and helpful. 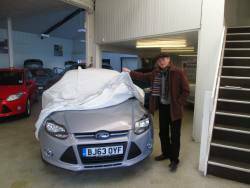 The repair was first class!I would have no hesitation in recommending this garage to a friend. 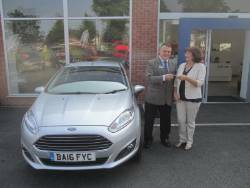 A very very delighted Suzanne ,unveils her new car which she bought off Steve Haley at Hodson Ford . 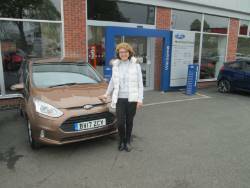 This is what she said on a recent ford survey " I was very impressed by the company from start to finish. 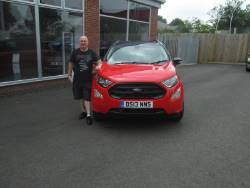 All email enquiries were replied to promptly and the salesmen Steve Haley was extremely welcoming and helpful. 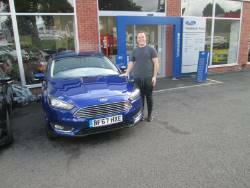 I would not hesitate to use Hodson Ford again. 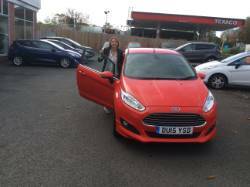 Adrienne Haynes was/is the most considerate and concerned Dealer I have ever dealt with. 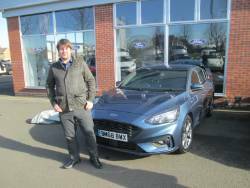 I was unable to obtain better service here in my local Ford dealership and I will no doubt return to Hodson Ford again in the future. Adrienne Haynes made my wife and I thoroughly welcome and very satisfied with her service and I trust she will be recognised for her hard work. 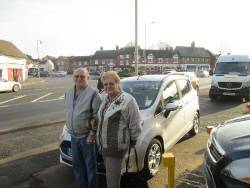 Complete satisfaction from first contact to finally accepting our new B Max. Excellent buying experience. 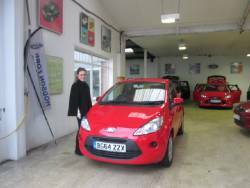 Adrienne was a wonderful and courteous sales representative. 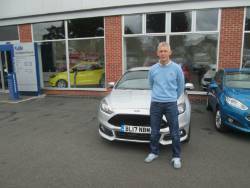 I would recommend Hodson Ford. Well done Adrienne! Very professional together with a brilliant and efficient service. Very pleased with the result. 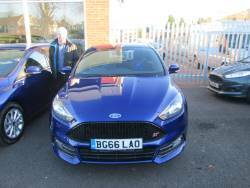 Should be taking delivery in October from Hodson Ford. 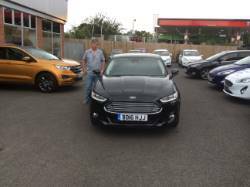 Steve and his team at Hodson Ford were excellent, wish other dealers were like them. I have dealt with Hodsons in the past with previous vehicles. 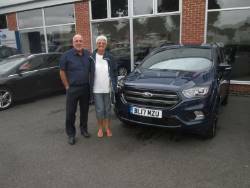 I have always dealt with Steve Haley who has given me a first class service, and is a credit to Hodsons and the Ford dealership in general. 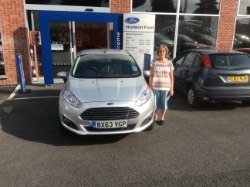 Adrienne at Hodson Ford was brilliant. Very helpful, friendly, and was a pleasure to do buisness with. It was my first time that i had used this service and i am very pleased that i did. 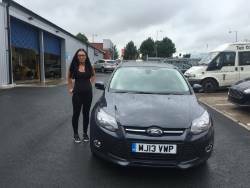 I recomend carwow to my friends and familly as the process was straight forward and easy. This was the most painless car buying experience ever. I got an offer, accepted the offer and the car was ready when promised. 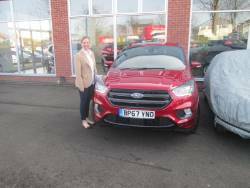 Adrienne at Hodson Ford was a pleasure to deal with and I would certainly return. No reservations whatsoever. Incidentally, the shop across the road from the dealership sells great pies. Frank Rigby. 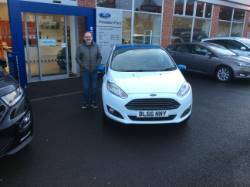 hodson ford to anyone thanks steve. 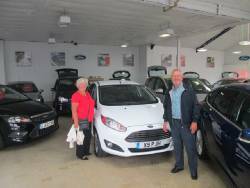 The salesman Steve Harley was very helpful and knowledgeable on the Fiesta and we are very happy with the service we received. 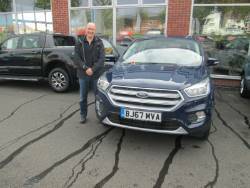 have today completed the purchase of the above two vehicles, and would like to thank the staff at Hodson Ford for their excellent service. Both vehicles were purchased from you (140 miles away) due to the very competitive pricing, I have saved approx. 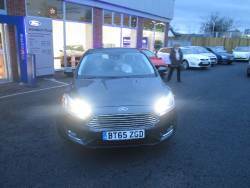 £6K against the Ford dealers in my area, they did not seem interested in doing a deal at a realistic price. Clearly the general public have too much money in the West Sussex if they deal with them.! Special mention to Steve Haley. 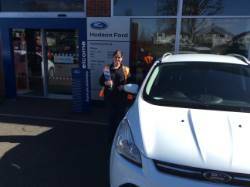 Excellent service received from Adrienne at Hodson Ford. Clear communication made the process straightforward. Highly recommended. 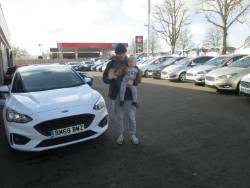 We found Hodson Ford very friendly and approachable, great customer service, kept us informed throughout the process. 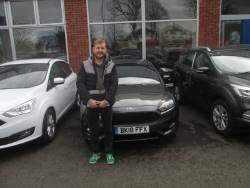 Definitely 5 Star service, we would have no hesitation in recommending Hodson Ford to anyone. Many thanks to Adrienne Haynes for all her help. 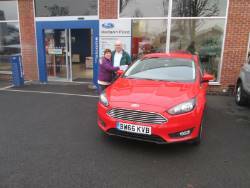 This is our second car from Mark at Hodson Ford at Penkridge. We are more than satisfied with all aspects of both deals. 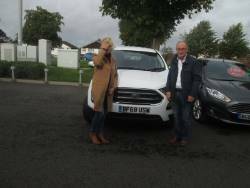 I love my new Ford Kuga. 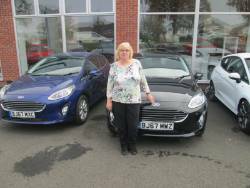 • "Well Done i was completley satsfied with the service provided". • "Everything was done just as you said it would be." 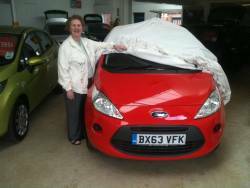 • "Great communication via telephone with Sharon, i was kept updated at all stages of the repairs." My vehicle came to your Bodyshop for some repairs. 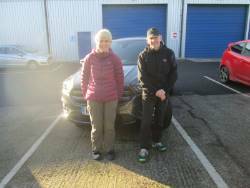 I was very pleased with the service and communication given to me throughout the repairs, the time frames for completition and also the repairs to my vehicle. 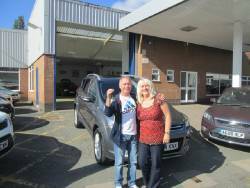 I was also very happy that Hodson Ford Collected & Returned my Vehicle Free of charge. My Vehicle came into your Body Shop for some repairs, all the repairs went fine thank you. 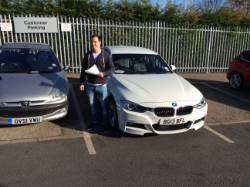 Fast abliging, Completley Satisfied with the Service Provided. 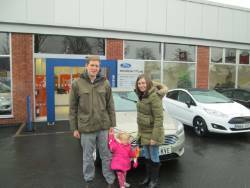 "Hodson Ford were excellent! Rob Caron was brilliant as usual!!!!! 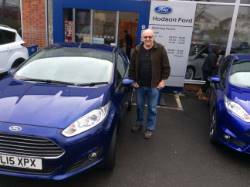 I have used Hodson Ford for approximately 30 years now". My vehicle was recently in your bodyshop for repairs. 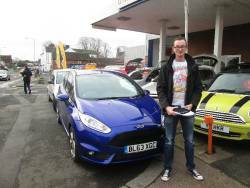 I was very happy with the work to my vehicle as well as the speed of completition. 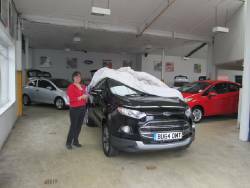 My vehicle came into your bodyshop recently for some repairs, from the outset i was very impressed with the organisation of the collection of my damaged car & the thoughtful updates from friendly staff as well as having my vehicle delivered back too me on the promised date. I found the process of buying a car through CarWow very straightforward. The best offer was from a dealer close to home and so I was able to meet face to face and agree the deal. 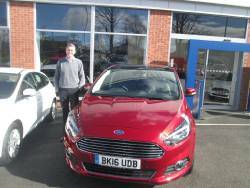 I would definitely consider using carwow again and would recommend it to others. I found the dealers efficient, professional, courteous, and very friendly. 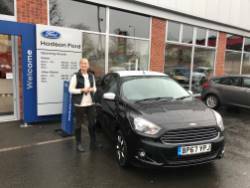 Adrienne at Hodson Ford at Penkridge was fantastic she quoted £2K cheaper than my local dealer and gave me a much better trade in value for my old car. 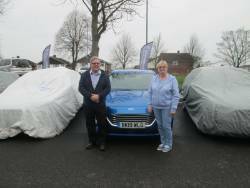 Within 24hour i had the best quote for a new B-Max and it was only 18 miles away. 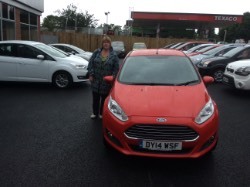 After two emails and calls i drove over and within one hour i had chosen my car and placed the order. 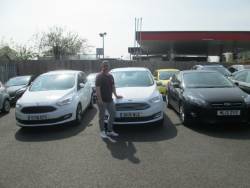 Nothing was too much from start to finish great service would use again. 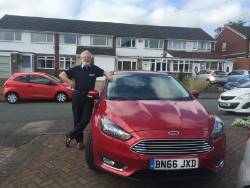 I bought a Ford Fiesta using carwow from Hodson Ford of Penkridge. 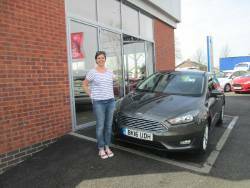 Carwow is a very simple and straight-forward service to use, and Adrienne Haynes of Hodson Ford was a pleasure to deal with - the exact opposite of the dim and blokey salesmen at my local Ford dealership. 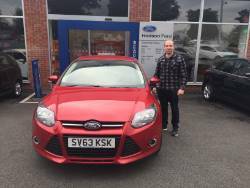 I've now collected the car and would recommend both carwow and Hodson Ford. 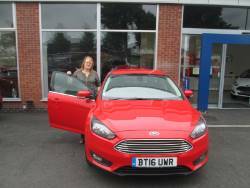 After dealing with Adrienne I can thoroughly recommend Hodson Ford and carwow. Everything went smoothly and a fair trade in price for my previous car was obtained. I shall be using this method when I purchase another vehicle. 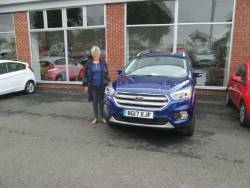 I was very impressed with Hodson Ford in Penkridge, Staffs. 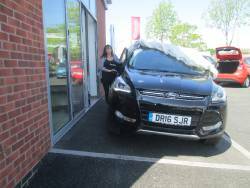 I was quite nervous about buying a new car but Adrienne put me at ease, answering all my queries with patience. I appreciated that no hard sell was used. 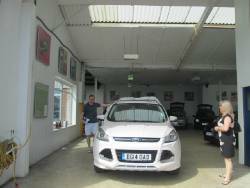 I would recommend this garage and the round trip of 280 miles was certainly worth it compared to more local garages. Many thanks for a fast and efficient Service while my vehicle was in your Bodyshop . My vehicle was in your Bodyshop for repairs. Overall i dont think you could improve the service you provided me, i found you to be a very professional company. 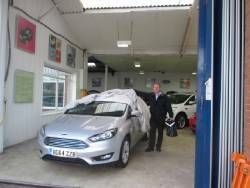 My vehicle came into your bodyshop at Hodson Ford for repairs. 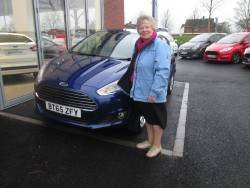 I was very pleased with the way the repair was carried out and in which Sharon kept me informed of the progress. As i live in the country i appreciated only being without my vehicle for a few days. 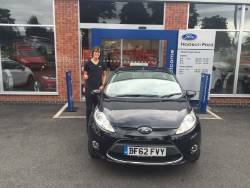 In my experience the service you provided was excellent. 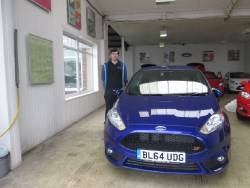 Hodson Ford kept me informed at all stages of the repairs. You are doing a great job so just keep up the good work as i cannot fault the service you provided to me. Thank You. 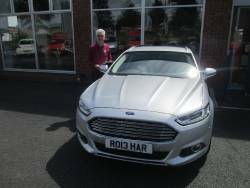 A extremly happy Mike Williams collecting his Mondeo Titanium X from Rob Caron of Hoson Ford. 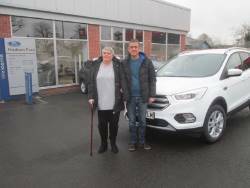 After bringing my vehicle down to your Body Shap at Hodson Ford i was completlley satisfied with the level of service from the staff as well as all repairs to my veichle. I really appreciated the telephone calls to keep me up to date on the progress of the repairs. 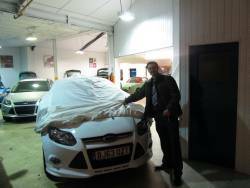 Also used the Collection and Delivery Service that was provided from you which proved to be a very good service. The salesman Steve was polite and efficient, explaining all about the vehicle's main features. Then patiently explaining all the financial details; going over some points to ensure that I fully understood all the paperwork. 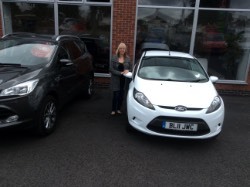 A delighted Mrs Harris collecting her new Kuga Titanium from Hodsons. 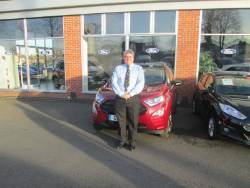 "Steve Haley is a very professional sales man and is very accomadating to meet all of your needs and concerns. 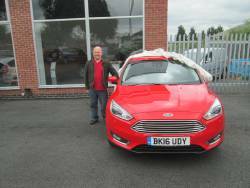 I have delt with hodson ford for a few years now and have never been dissatisfied with any aspects of the service received . 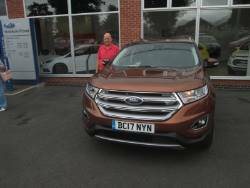 I have recommended hodson ford to a few friends and they have purchased a new car from you"
John is very happy to receive his new car from Steve Haley. 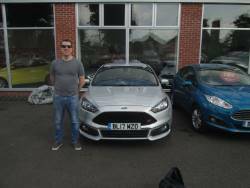 He ordered his Zetec S with several extras and cant wait to try them out. This is what he said to ford on a recent survey. 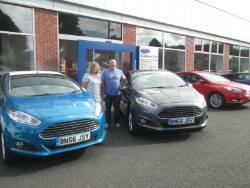 "I have bought many Ford vehicles over the years including Fiesta, Focus and Mondeo all from new. This will be my second Focus. 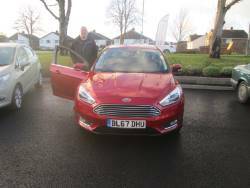 Sales service was excellent as usual and Steve Haley at Hodsons gave a thorough explanation of all the key features of the new Focus". 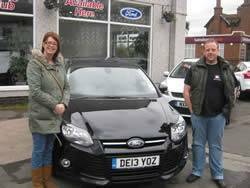 I can highly recommend buying a car from Rob & Adrienne of Hodson Ford, very easy to deal with and very friendly. 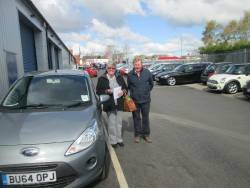 We ended up visiting the dealership as we were in the area, and were treated very well with no pressure to purchase. 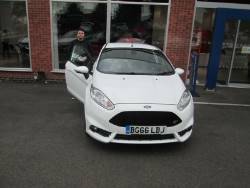 Now looking forward to receiving the car soon. The dealer was quick to respond to my quote request and could get the car I wanted quickly. 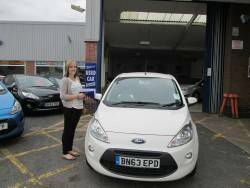 Adrienne was helpful on the phone with questions I had and I felt confident I would be looked after. 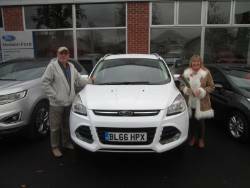 The car arrived as promised and we are very happy with it. 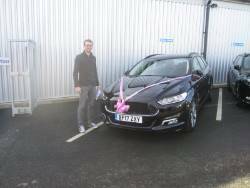 I have now had my Ford Focus Estate delivered. 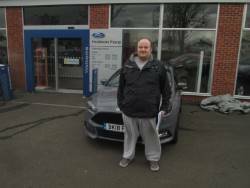 I was extremely pleased with the service I got from Hodson Ford. 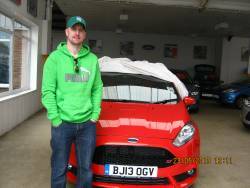 In particular I had to change my financing options twice which they did with no hesitation. I dealt with Adrienne who was pleasant and helpful at all times. 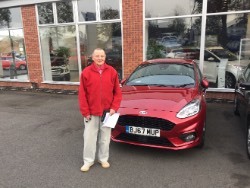 "I really can't think of any way in which the staff at Hodson Ford could have been any more helpful, especially as their knowledge of the possible financial packages available enabled me to buy a brand new car for the only time in my life, an achievement I never thought I'd attain"
Mr Jackson unveling his new car which he bought from Steve Haley , The salesman, was superb all round......so good that i bought him a beer!. 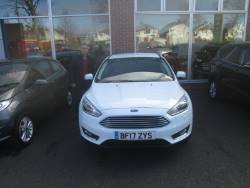 salesman was very pleasant in all ways a good deal on my new fiesta and a fair exchange on my astra could not ask for more very pleased. 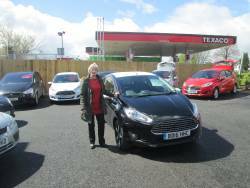 It was a pleasant experience, no pushy salesmen just very friendly helpful staff. 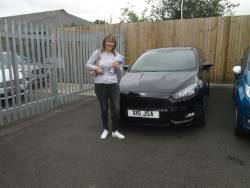 Beautiful car, extremely pleased with our new focus. 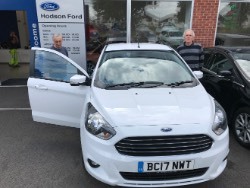 I would recommend Hodsons for a new ford, we've previously purchased a fiesta 3 years ago and will be heading back when the time comes to change that one too. Their service department is also excellent. 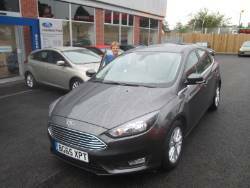 This is the third car i have brought from Hodson Ford. 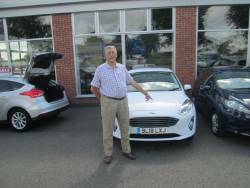 Our Salesman Mr Friendship makes the purchase experience very easy. 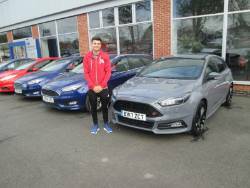 My son has also brought four cars from Hodson Ford. We would defiantly recommend the Dealership to our Friends. 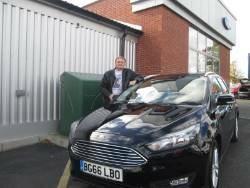 Mr Roche was delighted to unveil his new purchase before having the controls explained to him by his salesman steve . 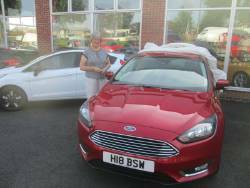 Collecting another fabulous Car from Hodson Ford. A seemless process with excellent Staff especially Adrienne & Dave. 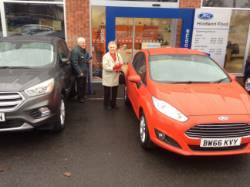 It feels like you belong to the "Hodson Ford Family" you know you will be looked after whatever your needs are. Congratulations on your excellent service. 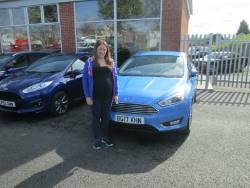 Laura has the pleasure of unveilling her new Fiesta Titanium Ecoboost which she bought off Steve Haley. 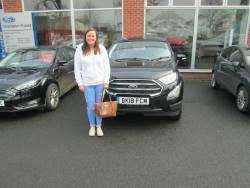 Having been recomended to go to Hodsons ,Laura was over the moon with the service she recieved. 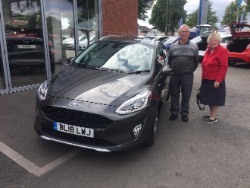 Ron and his wife take delivery of their new Fiesta Titanium X .They said the whole experience of buying a new car had been enjoyable thanks to Steve Haley's assistance. 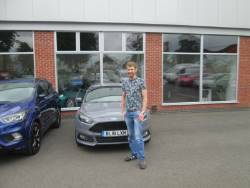 A very pleased Mr Cooper collecting his new Ford Focus Zetec S from Hodson Ford. 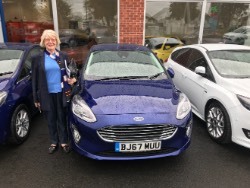 A very very happy cuustomer Mrs Veronica Mcvean ,colecting her new car from Steve Haley and her comments to Ford were "They were very helpful, polite, and gave their full attention to the matter in hand." 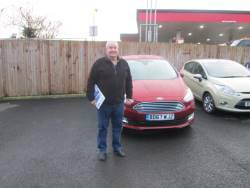 I thought that Mr Friendship of hodson ford was very attentive and a pleasure to deal with. 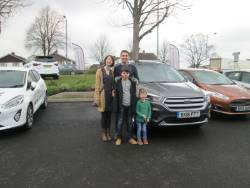 This is the 5th car we as a family have bought from hodson ford , and i have also recommended a friend to hodsons who lives in london and bought his car from them,Mark Friendship the salesman is always easy to work with and buy cars off and when you arrive to collect the car everything is in place to make the purchase very simple and quick ,Well done mark. 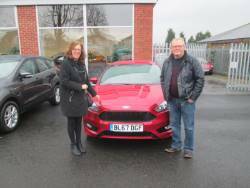 I have brought many new cars through hodson ford and i have always purchased through mark friendship and have passed friends onto hodsons ford who have also purchased cars, Mark is a credit to hodsons. 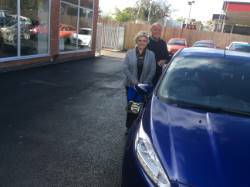 Dr John Morris and his wife collecting their New B-Max which they bought from Steve Haley . 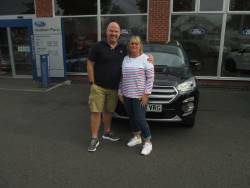 Although we have been impressed by the Dealership, it's actually the representative that makes the difference and the one person we will return to buy a car from is Steve at Hodsons - He is a person we trust and we respect. This year’s What Car? 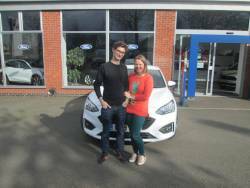 Awards saw the UK’s favourite car brand, Ford, win a record four trophies. 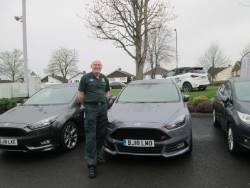 The new Ford Fiesta and Focus ST received accolades from the popular car buyer’s guide, and the Ford Mondeo took the awards for Best Family Car and Best Estate Car. This is the most the brand has won since the event began 25 years ago. 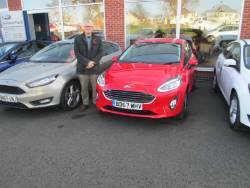 Hodson Ford were a pleasant experience all round and Mark Friendship was helpful knowledgeable friendly and a pleasure to deal with. Would definitely use/reccomend the dealership and Mark again. Known, trusted, local dealer. 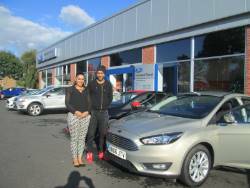 Have purchased several cars from them before and always received excellent service. 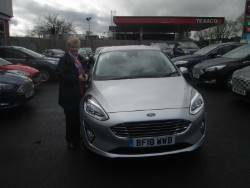 It was very nice to see and speak to a lady sales person. 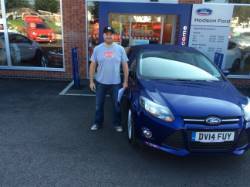 I have used Hodson Ford for a few years now and have always had an excellent service especially from Steve Haley. 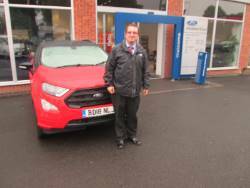 Mr Kevin Stockley from Sandwell said of his service at Hodson Ford "As ever, a completely satisfactory experience. 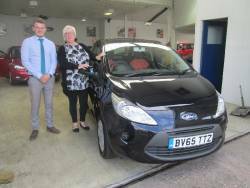 Staff are the key to service, yours are first class"
Vehicle buying experience went very smoothly and I was treated with respect and courtesy from my salesman Steve Haley . 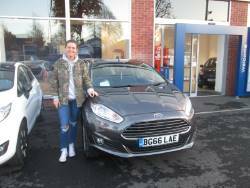 "I would just like to say a big thank you to the staff at your dealership for making it so easy to purchase my first car. 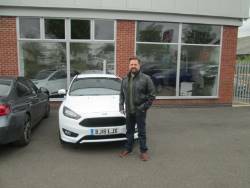 Steve Haley was very helpful when I first came down to view the car I had seen online, he didn't try and pressure or force the sale on me which is very off putting, and something I experienced in every other dealership, making me feel uneasy and leave. 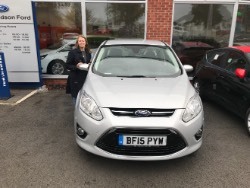 Last but not least, I would like to thank Adrienne Haynes for going beyond my expectations and staying late so I could collect my vehicle"
I just wanted to say thank you for the quality service with the new car. 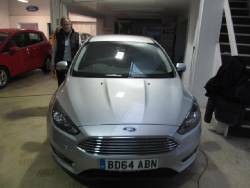 It's a great car and my Mrs loves it so I'm very happy with the deal. 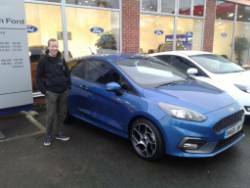 Thanks again for everything and I will definitely recommend your dealership to anyone looking for a good quality Ford with service to match. 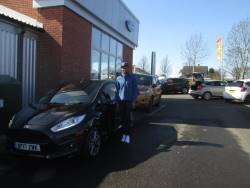 Mr May picking up his 9th new car fron Hodsons. 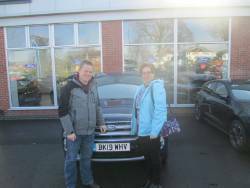 Mark was very welcoming and friendly and gave us the best deal from all the dealerships we went to. Very good. 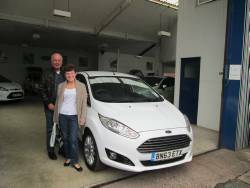 Fantastic Service from a Fantastic Garage. 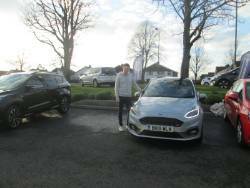 I have been a customer of Hodson Ford for a number of years and have always dealt with the same salesperson Mr R Caron and always received excellent service. 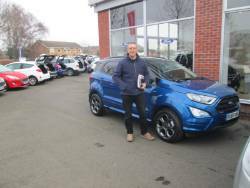 I had no problems what so ever in purchasing this Kuga, in fact I was very impressed with the efficiency of it all from start to finish. Hope to do buisness again with this dealer and Steve Haley. 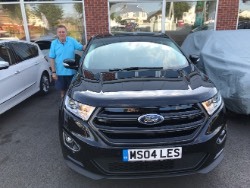 Would like to givemy thanks to the sales team at Hodson Ford and especially Steve Haley who was fantastic throught out the purchase process and could not have done more to keep myself and my wife informed at every stage of buying experience. 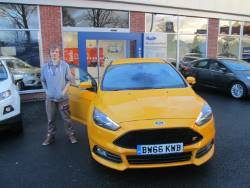 I would not hesitate to use Hodson Ford again in the future. Thanks again Steve for all your time and effort you put in on our behalf. 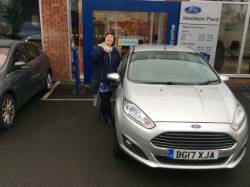 I was very pleased and because I was treated so well I will be having a car from Hodsons Ford again. Even some of my friends have now been enquiring on my referral. Hodsons and Steve Haley the salesman are very professional. 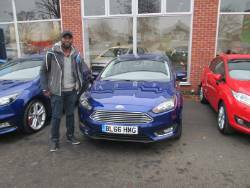 This is the 5th car we as a family have bought from Hodson Ford and I have also recommend a friend to Hodsons who lives in London and bought his car from them. 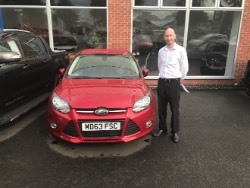 Mark Friendship the salesman is always easy to work with and buy cars off and when you arrive to collect the car everything is in place to make the purchase very simple and quick. Well done Mark. I was completley satisfied with the repairs completed to my vehicle. 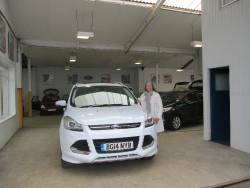 The staff at G Hodson bodyshop were all very helpful and friendly. I would recommend them to others. Thank you. 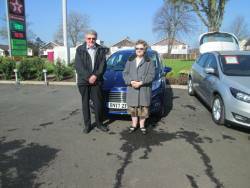 A extremely happy Mr and Mrs Lawton collecting there new Ford Focus Titanium. 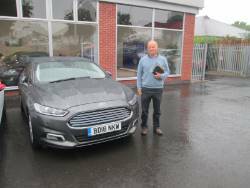 I was completely satisfied with the repairs Hodson Accident Repair Centre did to my Ford Fusion on behalf of RSA Insurance Company. I would recommend them to anyone – thank you! 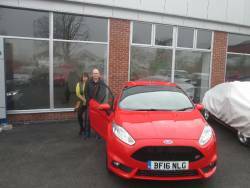 Picking up his new Ford Focus. 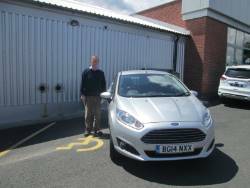 I was completely satisfied with the whole repair experience given by G Hodson and Son Ltd - Thank You! I was happy to fill in your customer feedback form with completely satisfied to all questions. Well impressed with your excellent service repairing my damaged car. Had previous experience of this dealer. Salesman was very professional and friendly. 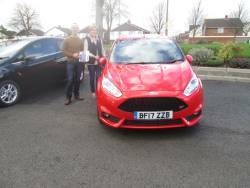 He understood my requirements for the car and ensured that these were delivered stated a delighted. 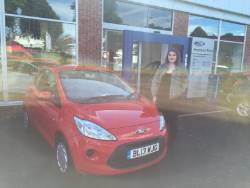 A very Happy Miss Heather Griffin Collecting her new Ford Ka. 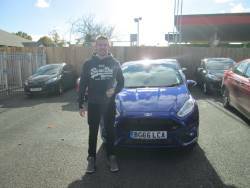 "When asked to rate my experience having my car repaired at G Hodson Accident Repair Centre I replied that I received very good customer service from the Bodyshop Staff and that the repair was well done!" 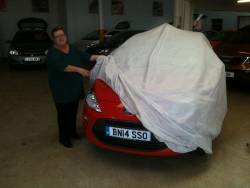 The dealer was fabulous and we particularly liked the 'reveal' aspect of the new car being uncovered in front of our eyes. Good garage would definitely use again. When asked if we could improve our service he replied –" Really don't think you can!!" 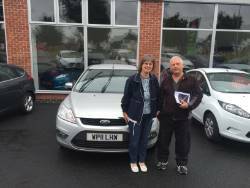 • "Excellent service from start to finnish." • "Great communication via telephone(Sharon)." 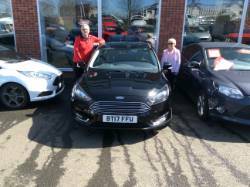 • "All round a faultless service!!" Buying a new car isn't something I or my husband enjoy doing, we know what we want we don't want a sales man pushing us into something or pushing all the extras. 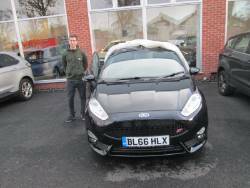 We explained this right from the start to Steve the sales man, he was most helpful with out all the pushing we received from Hartland Ford when we purchased our last KA. I would recommend him to any one & would certainly go back in the future. 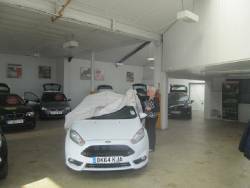 Fully satisfied with the repairs would now like to actually see the repair centre itself(has now seen us when car was collected and kindly gave the staff a tin of biscuits) Thank you also for cleaning the vehicle. 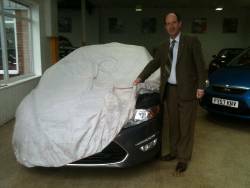 Other than when we first notified the insurance company of the accident all other dealings have been well handled by Hodsons Accident Repair Centre. The salesman we dealt with was Mark Friendship. 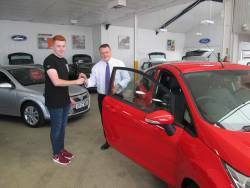 He was very approachable and professional throughout and made the whole purchasing experience relaxed and enjoyable. 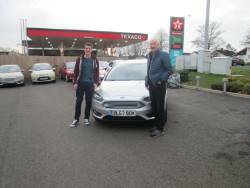 At no time did we feel pressured as we had been at larger Ford dealerships nearer to our home. (Indeed, we went to him on the recommendation of several of my husband's work colleagues.) 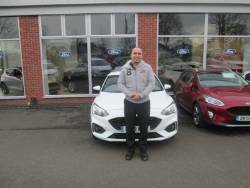 Mark was willing to " go that extra mile" in order to ensure complete satisfaction and explained everything carefully and thoroughly. 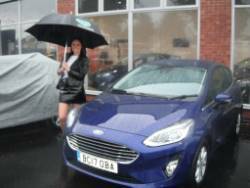 I was completely happy, a friend was Hodson Fords trumpet who is an existing customer. He said I would not find a better garage for price and quality. He was right! 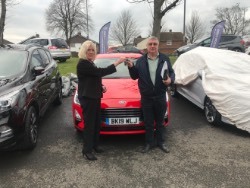 I have now purchased my last four Ka's at Hodsons, all of them through salesman Mark Friendship, who I find so easy to get on with and trust him totally. I find him a credit and assett to the Ford Dealership. 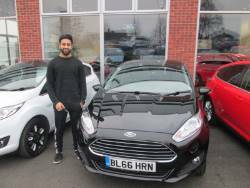 The staff at Hodson Ford were very friendly and helpful giving that personal touch when discussing the required information to purchase my Ford Fiesta with satisfaction. 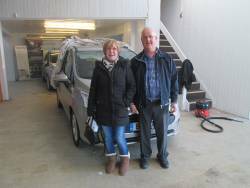 “In March 2010 I unfortunately had an accident in my VW Golf. 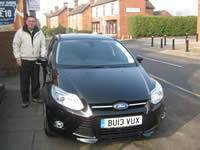 When I contacted my insurance company they advised me the closest repairer was Hodson, s in Penkridge. 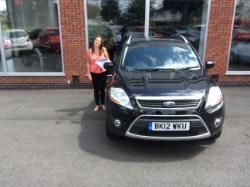 After I gave the go ahead for Hodson,s to undertake the repair the entire process of recovery was effortless.